Last November I had the chance to return to Burma (Myanmar) for Australian NGO Act for Peace to do a story on how local human rights workers are fighting for the rights of their communities. Illegally recruited child soldiers, human trafficking, slave labour, land confiscation and corruption are just some of the issues they deal with on a daily basis, often at great personal risk. Far from prying eyes on an isolated chicken farm in the Irrawaddy Delta, five hours drive south of the Burmese capital Rangoon, a group of boys sway in hammocks, smoke, talk and check their mobile phones. Their conversation however is unlike most teenagers, as these rescued child soldiers share stories of brutality, slave labour, beatings, torture and fear at the hands of the Burmese National Army. All were kidnapped, sold or tricked into joining the army and endured years of confinement before finally being released with the help of local human rights workers, dedicated to rescuing child soldiers and fighting other human rights abuses in Burma. Arun standing with other child soldiers who have escaped the Burmese Army. They were all illegally tricked into joining the army when aged 14-16 years old. Most spent over 2 years in the army and were badly treated. 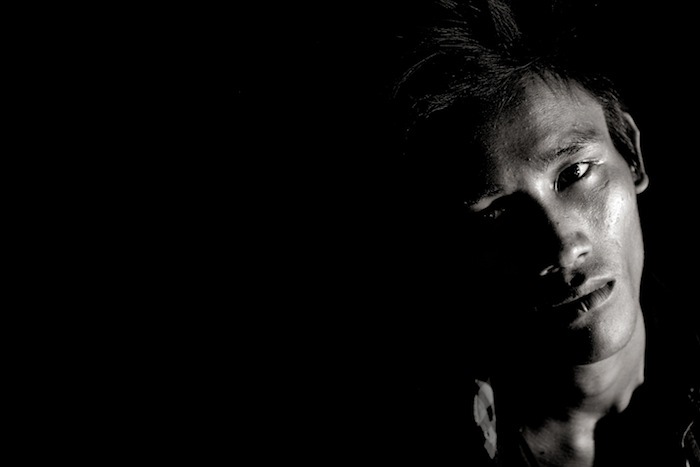 Khin was 14 when his uncle sold him into the army for just $200 and a bag of rice. After the first two days he tried to escape but was recaptured, imprisoned and beaten by the officers. 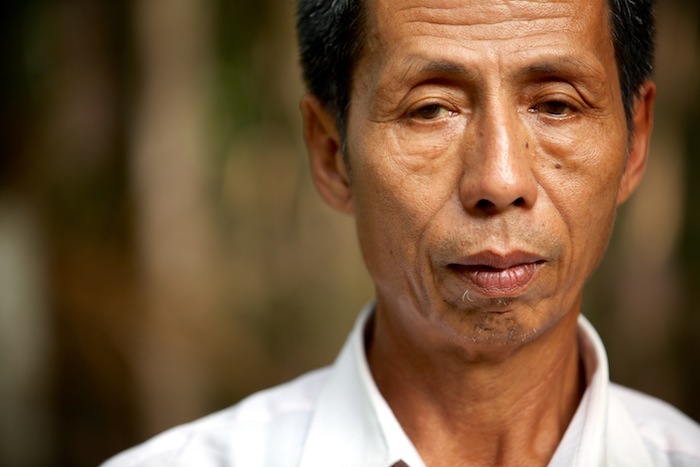 For over a year, his family desperately tried to find him and had almost given up hope until they were introduced to May Lyan, a community organiser with the Myanmar Council of Churches who specialises in securing release papers for child soldiers. Despite Burma recognising that the recruitment of child soldiers is illegal (it signed a joint action plan with the UN in June 2012 to end the use of underage recruits) it took May Lyan over 8 months working with lawyers and other NGO’s such as the International Labour Organisation to secure Khin’s release. He had no contact with his family for most of his 2 years in the army and was just about to be sent to the front line when his papers came through and he was able to return home. Khin (18) was 14 and living in the Irrawaddy Delta region when his uncle sold him into the Burmese Army for $200 and a bag of rice. He ran away after 2 days but was caught, put in the army prison and beaten. He had to spend over 2 years in the army. The use of child soldiers remain a controversial issue within both the Burmese Army and the numerous ethnic group militias. There are an estimated 5,000 child soldiers still active in the Burmese Army. The government has said they would demobilise them but progress has been slow. Khin pictured with Myanmar Council of Churches Community Organiser Naw May Lyan who helped secure his release and his father who spent two years looking for him. Since the 2012 agreement, the army have released over 270 underage recruits but an estimated 5,000 child soldiers are still believed to serve not only in the Burmese Army, the Tatmadaw, but also in the numerous rebel groups that have been fighting the government for the past 65 years. 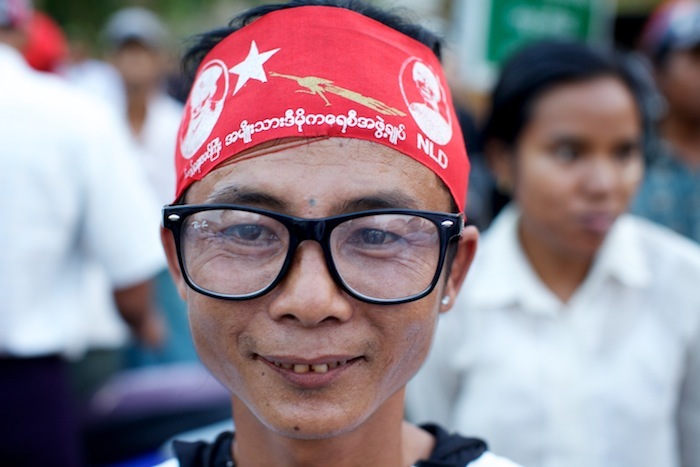 Life is quickly changing in Burma with free and fair elections being held in April 2012, a less censored press and increasing international trade opportunities. However, there are number of issues that are still taboo for the government, such as child soldiers, human trafficking and corruption. These are the issues that the 20 community organisers such as May Lyan and Mon Tome Sein deal with on a daily basis, often at great personal risk. 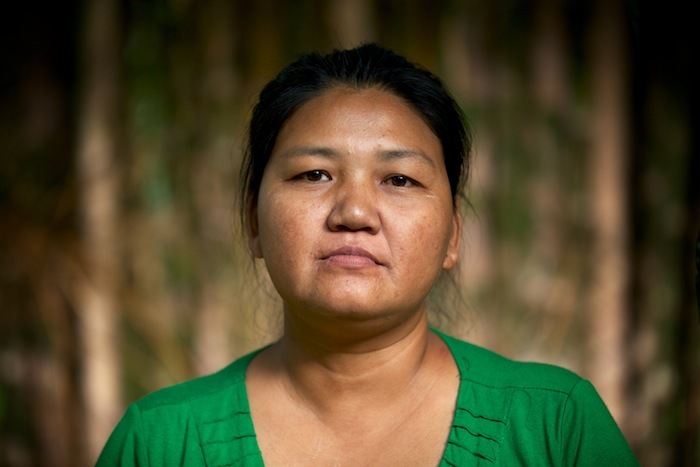 Naw May Lyan (46) is a Community Organiser (CO) for the The Myanmar Council of Churches and now lives in Yangon. She has been a CO for 4 years and has dealt with issues such as child soldiers, land confiscation and labour disputes. Another child soldier that May Lyan is helping is Sein, who is still awaiting his release papers and lives in fear of being caught by the police or army. A decision to escape a violent home sealed his fate. Sein explained, “I was 15 years old when I volunteered for the army. I was living at home and my step dad was an alcoholic who beat me so I decided to run away. A friend suggested that we should go to the army because they would look after us. I immediately knew I had made a bad decision but had to stay in for 3 years. During that time I ran away twice. The first time I had to hide in streams and couldn’t contact my parents in case the army caused trouble for my family and tried to recapture me. I was on the run for two years and became a tricycle rider and sold coal. If I thought the army was following me I would change location and job so I moved from town to town. Whilst on the run, Sein’s parents contacted MCC Community Organiser Naw May Lyan who helped locate him and made his case known to the International Labour Organisation. He has been let out of the army and has a Protection Letter from the ILO but has still not been officially released from the army, so he is afraid he could be picked up and forced to return. May Lyan continues to fight for his release papers. Sein was 15 when he volunteered with a friend for the Burmese Army after running away from an abusive home due to his stepdads drinking. He had to spend 3 years in the army and during that time he escaped twice. 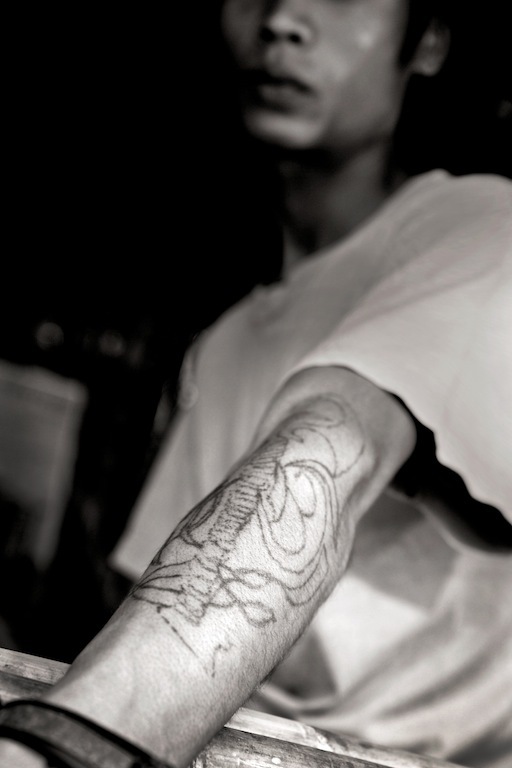 Sein was tortured by the officers who also tattooed his arm as punishment. Arun didn’t have to fight but had to work on the army farm, 7 days a week and wasn’t given any food. He and the other child soldiers were regality beaten and abused by the officers. He wasn’t able to contact his family for the first year. The rate of recruitment of child soldiers has dramatically reduced and the government is slowly becoming more open about the issue, even co sponsoring billboards around the country warning parents of the dangers. However, with thousands of children still in the ranks, the need for community organisers remains as strong as ever. 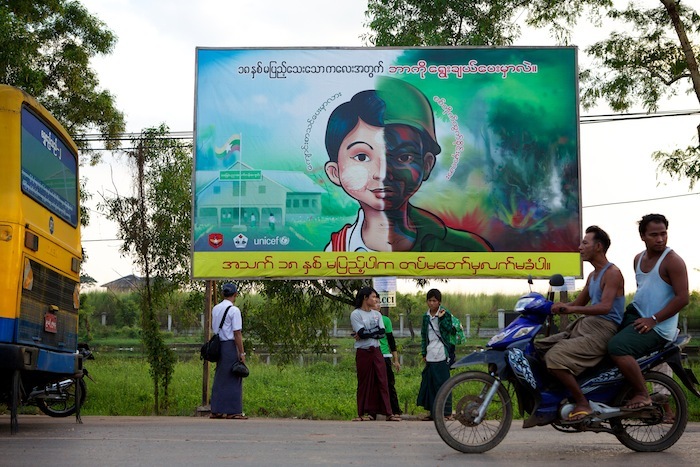 A Government and NGO sponsored billboard on the road into Yangon about stopping child soldiers joining the army. Earlier this year I had the opportunity to return to Afghanistan and it was certainly one of the more challenging assignments I’ve had for some time. In 2004, I covered the first Presidential Elections and there was a sense of hope and optimism about the future as the Afghani people took their first tentative steps towards democracy. This time I was tasked by aid agency Act for Peace with reporting on their girls’ education program in eastern Afghanistan for their main annual fundraising and advocacy campaign. 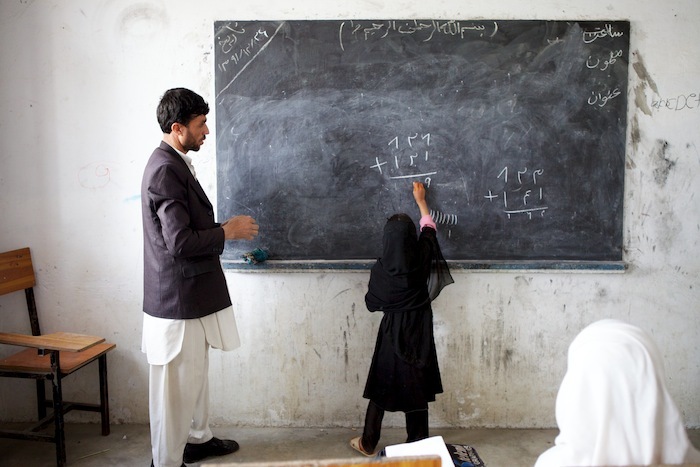 Adela (9) in class at a High School in Nangarhar Province, Eastern Afghanistan. She said, "I want to become a doctor to help my country." Without access to education, girls face a lifetime of poverty and oppression. Women without an education are more likely to get married younger, have more children and have very few job opportunities. Their children are also more likely to live in poverty. 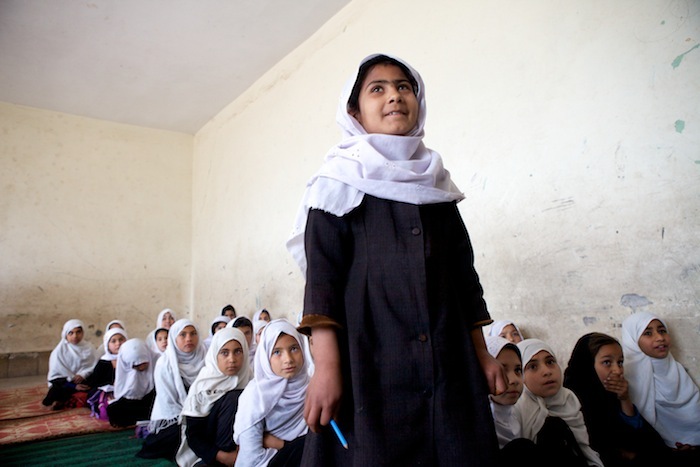 Afghanistan-Girl’s Education from Richard Wainwright on Vimeo. Above is the fundraising video that was made for Act for Peace’s main donor base in Churches around Australia. In terms of security and access this was one of the more complex assignments I’ve completed, having to negotiate the multiple issues associated with working in such a hostile environment and the cultural sensitivities, especially in the more rural regions. After flying into Kabul, Omar the guide/translator, Ahmed, our excellent burly 6ft Pashtun driver and I set off to Jalalabad, traveling at high speed in a beaten up old Toyota Corolla keeping as low a profile as possible through some of the most spectacular scenery I’ve ever seen. Basing ourselves in the partners compound in Jalalabad, which was constantly being over flown by Apache helicopter gunships and Predator drones, we would visit schools and other projects in rural Laghman and Nangarhar provinces. The partner staff were great hosts who cooked fabulous food and had a very black sense of humour. Before setting out each day the cheerful elderly Afghan director used to wave goodbye and say, ‘Hopefully we’ll see you later then? Anything can happen, this is Afghanistan.” before breaking out into a big smile. Jalalabad to Kabul by Road-2013 from Richard Wainwright on Vimeo. Filmed on a go Pro, a quick video glimpse of life along the road from Jalalabad to Kabul. Due to the high risk of kidnapping, we could only spend about 15 minutes in any one place so we had to work very quickly. We did manage to spend a bit more time in some of the schools as they were out of the public gaze and the head teachers were incredibly accommodating. Gaining permission to film and photograph the girls and female teachers proved quite difficult for cultural reasons but because of the strong partner relationships there were some schools that did allow us access. Noria writing on a blackboard in Laghman Province, eastern Afghanistan. Her father is a farm labourer and she has 7 sisters and 4 brothers. One of her sisters studies medicine at University. Noria is the middle child and likes learning Pashto and wants to be a doctor in the future. 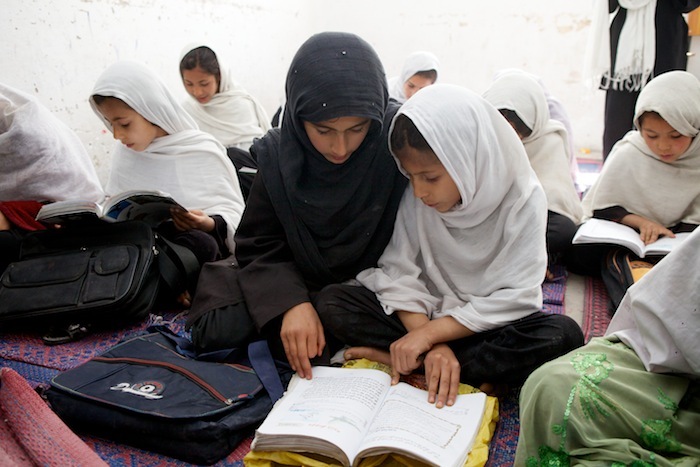 Girls reading at a school in Laghman Province, eastern Afghanistan. 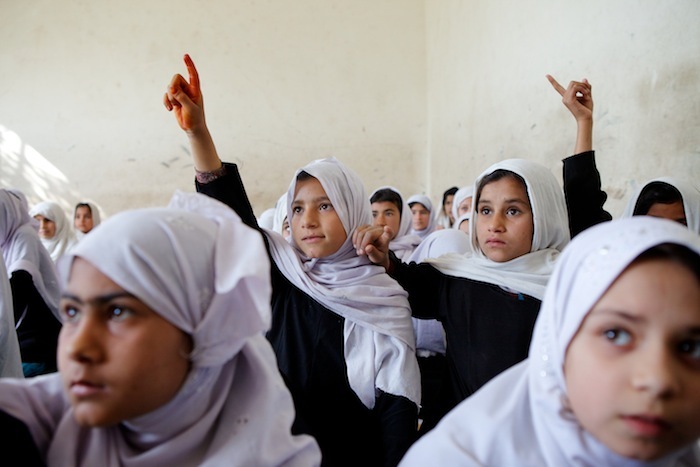 Currently, only 5% of women in Laghman Province are literate. Whilst the increasing attendance numbers are encouraging, Afghan girls and boys still face many barriers to receiving an education. Some of the issues that schools face are high rates of absenteeism due to the security situation and children having to work to support families because of crippling poverty. 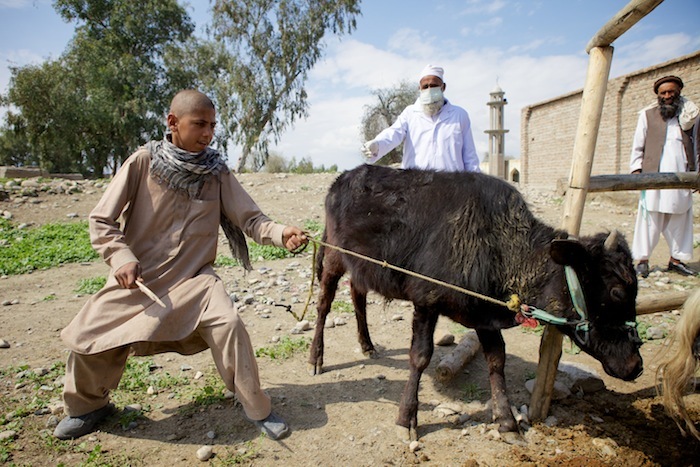 A boy helps a veterinary surgeon give antibiotics to his cow as part of the Food Security Program supported by Act for Peace partners in Qarghayi District in Laghman Province, eastern Afghanistan. 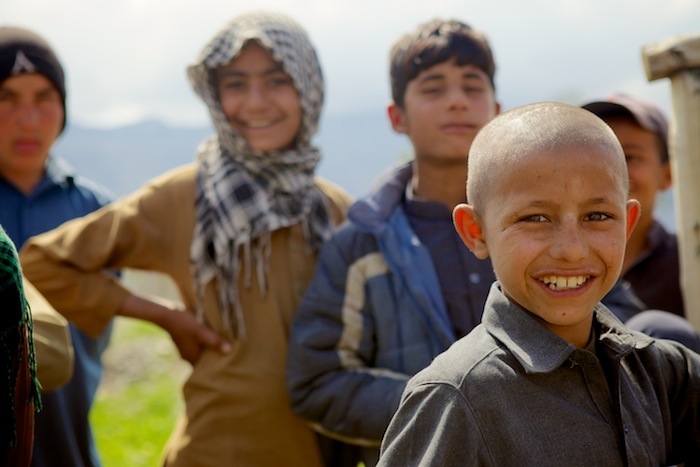 Boys take a break from work in Qarghayi District in Laghman Province, eastern Afghanistan. Both boys and girls miss out on an education because they are forced to work to help their families survive. 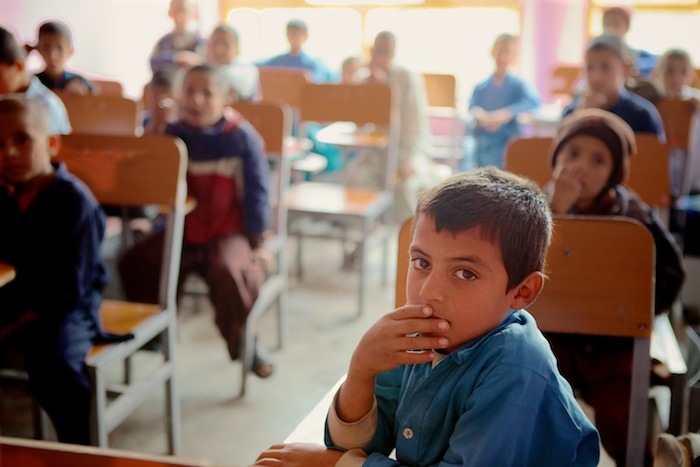 Boys attending a class in Nangarhar Province. The morning shift is for girls and the afternoon shift is for boys education. At present they have 2,820 girls enrolled and 1052 boys. There is also a lack of qualified female teachers, which is a major problem in more rural conservative areas where only female teachers can teach girls beyond primary education. Because of this, many of the students said they wanted to either be teachers or doctors when they grow up. Shahida (29) is one of the few female High School Principle. One of the biggest issues is training more female teachers so the program aims to increase capacity and develop a strong pool of female teachers. She said ,"Education and learning are very important in Afghanistan. Students can solve their problems by education. Education is message of peace." 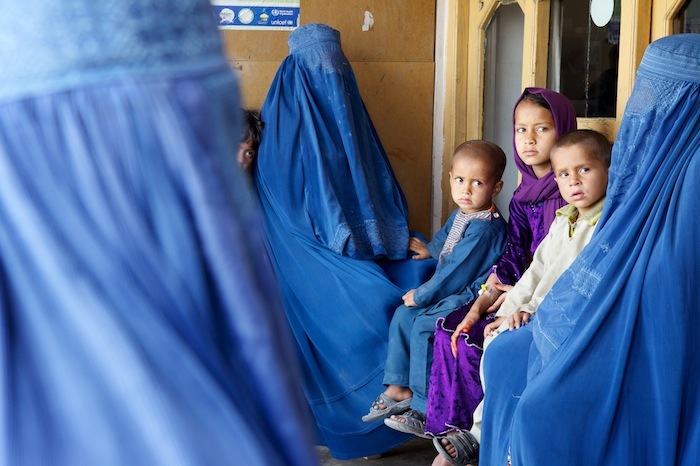 A medical clinic in Nangarhar Province. 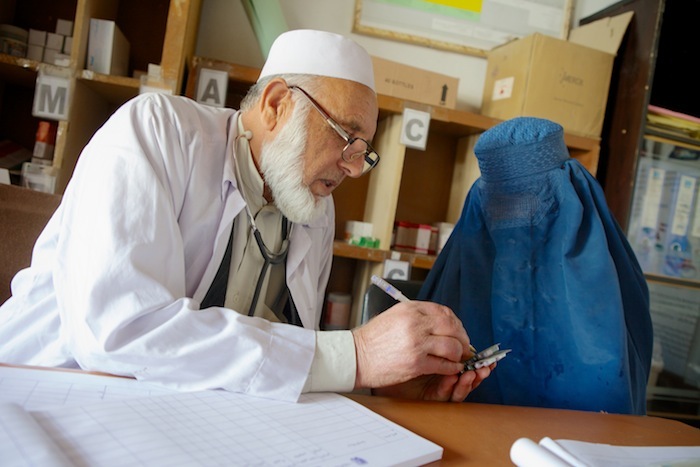 Through decades of conflict, the health system has been destroyed in Afghanistan. 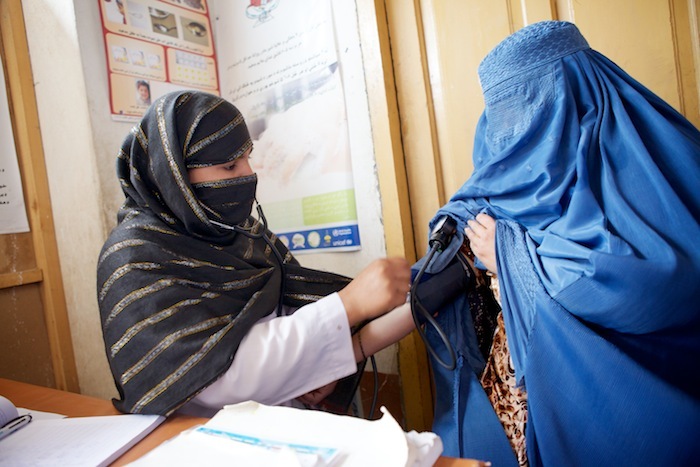 Hussan (21), a newly qualified Midwife who runs a clinic just outside Jalalabad, takes the blood pressure of a mother. 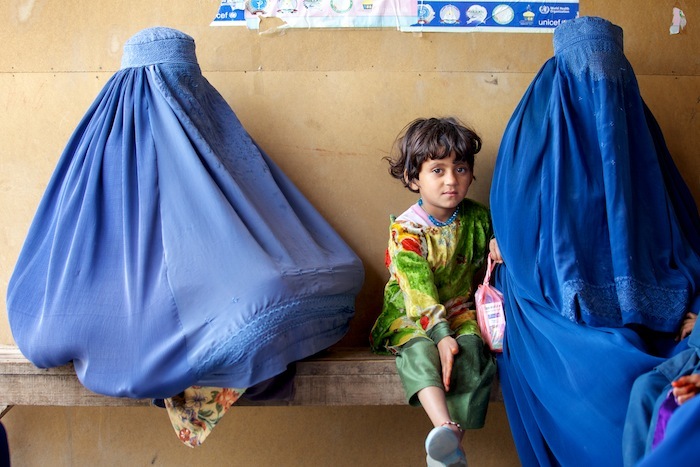 A young girl waits with her mother to be seen at a clinic in Nangarhar Province. Most doctors are male which is a problem in rural areas for female patients. However, one of the biggest barriers to girls’ education are cultural attitudes that are still present, with families believing that girls should remain at home. One of the key elements of peace building is changing attitudes and behaviours of people and encouraging the local population. Act for Peace and their partners are actively engaged in this by raising community awareness of the importance of education through local Shura Council members and the Parent Teacher Committees. Jan Muhammad, a 50 year old Shura Council member from Jalalabad, is a clear example of how effective this is. A labourer by trade, he came from a very poor background and had no education but through the advocacy work the local partners implemented he has been convinced education is important and is now what could be described as an activist. Not only does he send his 3 younger girls to school, his eldest daughter has just started as a teacher and he is an active member on the parent teacher committee. One of his duties on this committee is to visit families that don’t send their children to school to find out why and to help encourage them keep up a regular attendance. 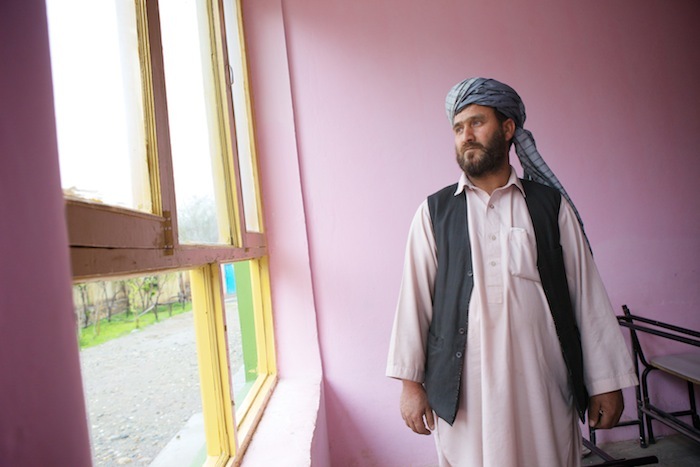 Jan Muhammad (50) is a Shura Council member and is also on the Parent Teacher Committee at a High School in Jalalabad. Local Shura members are now promoting girls education in the communities which is a major achievement. Good quality education is considered to be one of the fundamental building blocks of a peaceful nation and is key to a countries development, so it’s people like Jan Muhammad on the Shura Council, the teachers and members of the Parent Teachers Committees who strive to create change that is critical to the grassroots building of the nation. 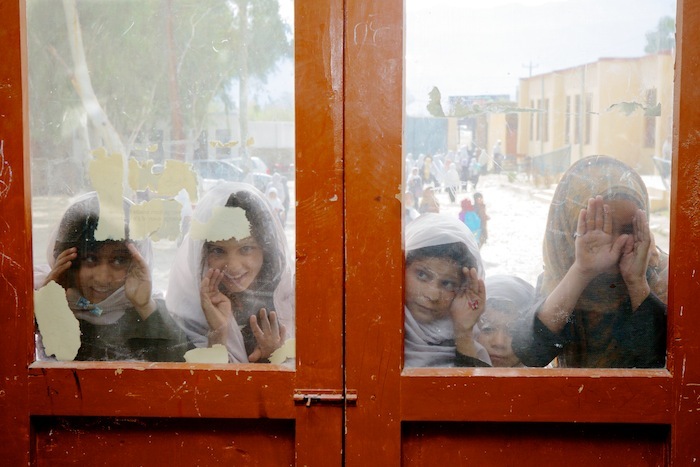 Girls looking through windows after class at a High School in Laghman Province, eastern Afghanistan. Insecurity remains a major problem in accessing education in rural areas along with forced marriage and extreme poverty. Afghanistan is once again at a cross roads as coalition forces prepare to leave in 2014. What will happen to Afghanistan after this no one really knows but one can only hope that reconciliation can be found and that the new generation of Afghans get the peace that this amazing country has long deserved. Girls in class at a High School in Jalalabad. 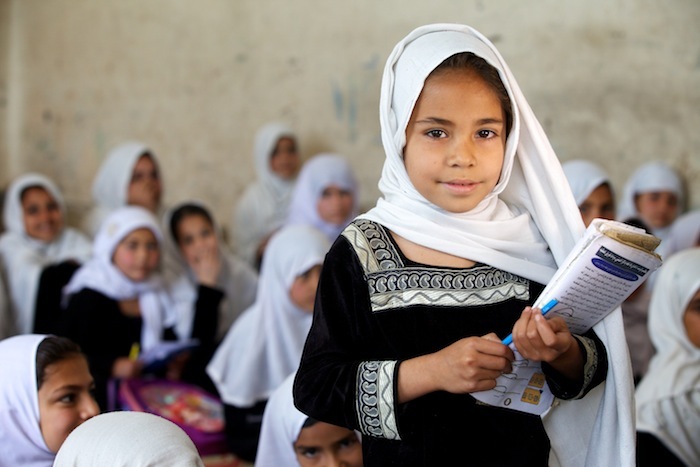 If you’d like to contribute in helping girls achieve their educational goals in Afghanistan via the Act for Peace Christmas Bowl Appeal please click here. I haven’t entered a photography competition for a while so I was pleased to see that an image that particularly resonates with me from an assignment in Jordan earlier this year to report on the Syrian refugee crises made the finals of two competitions. The first was the Fremantle International Portrait Prize and second competition was the Perth Centre of Photography Iris Awards 2013. I’ve blogged about this picture in my assignment review and it remains one of my strongest images from Jordan so I’m happy that members of the public and judges have reacted to it in a positive way and has given the refugee situation in Syria even more coverage. I only spent about 45 minutes with Ala and Zeena but their quiet dignity, devotion to their family and resilience to the horrendous situation they found themselves in was humbling. For me they break every stereotype of a refugee that some would have you believe. 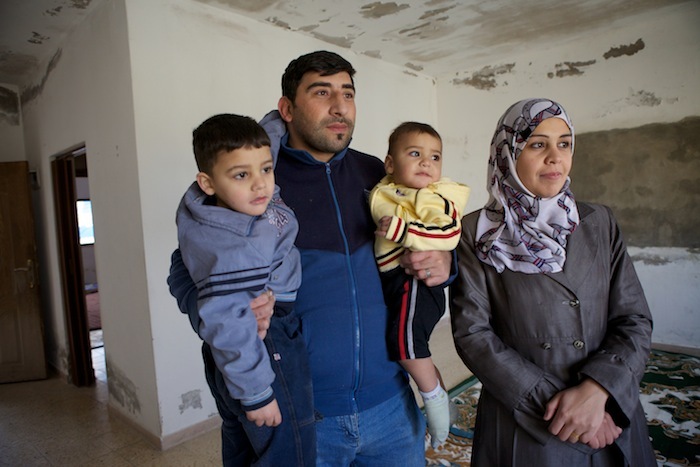 Alaâa (29), Zeena (26), Ammer (4) & Mohammed (1) fled Homs a month ago and are now living in this single room in Amman. Like all other refugees they only managed to bring what they could carry over the border, so they arrived with just some baby food, nappies and their clothes in this suitcase and are now struggling to survive. They had a family bakery business making bread and sweets back in Homs but they were forced to flee after the bakery and their house were destroyed. They also didn't feel safe due to an increase in kidnappings. Whilst Za’atari camp may be the most reported on aspect of the Syrian refugee crisis, the vast majority of refugees who have fled to Jordan try and survive in the urban concrete jungle of Amman and neighboring cities. Sheltering in cold airless basements or unfurnished rooms, they are often hidden away and reliant on family contacts and the good will of the host community. One of the worst situations I witnessed whilst on assignment for aid agency Act for Peace was a cold, ground floor bare concrete shell of a room, dimly lit by a single light that was home to 17 people, including Zahra and her 4 children. Zahra shared this cramped space with two other female relatives and their children, who had all lost their husbands to the war in Syria. It was hard to imagine how difficult it must be living in these conditions, trying to bring up young children. 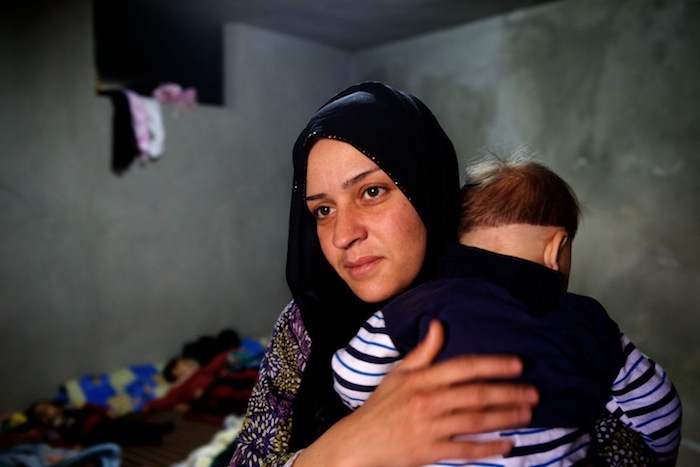 Zahra with her son living in a room with 15 other people in Amman. Many households have lost their husbands in the fighting like these families totalling 17 people, mostly youngsters, who now live together out of economic necessity and safety in this single room in East Amman, They fled the southern Syrian city of Daara after their houses were destroyed and their husbands killed in the fighting. Layla (6) Fadi (5) sleeping surrounded by their relatives and other families. 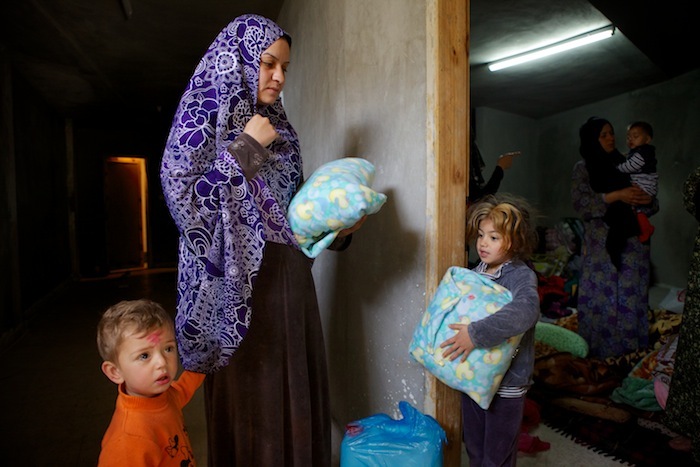 Najwa (27) comforts her son Yousif (1). 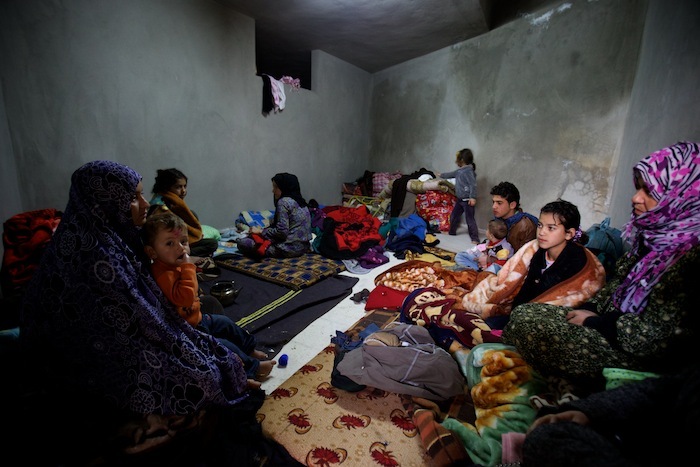 They arrived in Jordan with nothing except their clothes and found this room through a family friend and are surviving with help from neighbours and assistance from aid agencies like Act for Peace who have supplied blankets, floor mats and food items. For aid agencies, finding out exactly where these refugees are living is complicated as there is no central registration system so Act for Peace and their partners have formed a series of local committees made up of both Jordanians and Syrian refugees who work together to identify the most vulnerable newly arrived refugees in their communities and find out what their most urgent needs are. 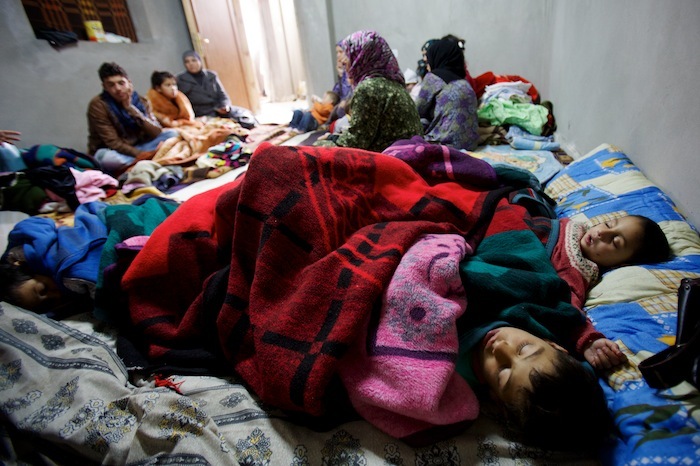 Most arrive with nothing so clothes, blankets, rugs, hygiene and cooking kits are essential. The biggest problem they then face is paying the ever increasing rents. These committees also look out for vulnerable Jordanian families. In a country that is straining under the burden of such a dramatic influx of refugees, ensuring the host community does not feel threatened or disadvantaged is essential, so conflict sensitive aid distribution is a crucial element of any program implementation. 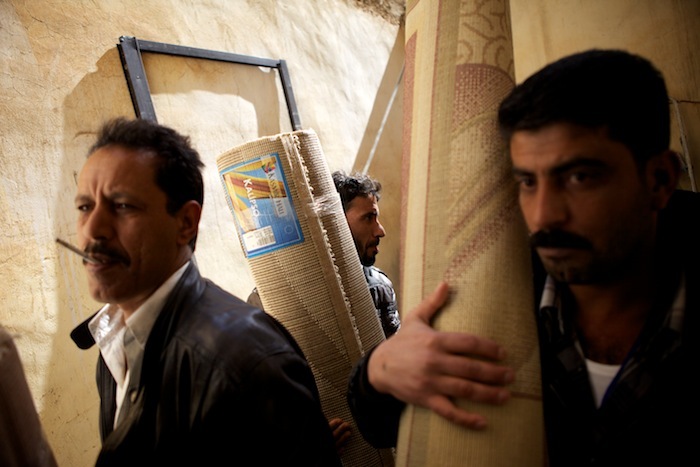 The IOCC (International Orthodox Christian Charities) distributing floor rugs to Syrian refugees living within the host community in the northern city of Mafraq which is close to the Syrian border. Zahra’s story is unfortunately far from unique. Every family we met had similar harrowing stories and faced the same hardships. 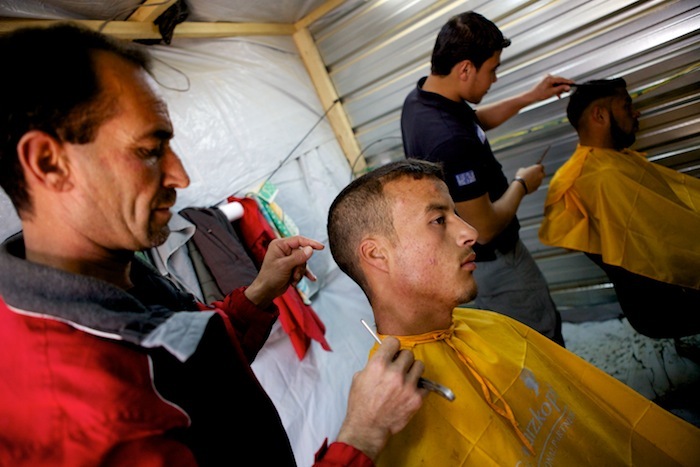 Many refugees arrive with horrific injuries, making their lives even more complicated, like Zahy, who is a blacksmith by trade. 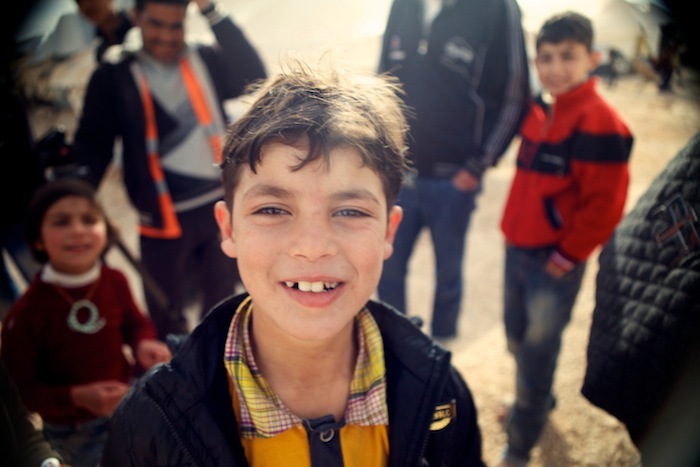 He and his family fled Babr Amr near Homs after bombing and fighting destroyed their home. 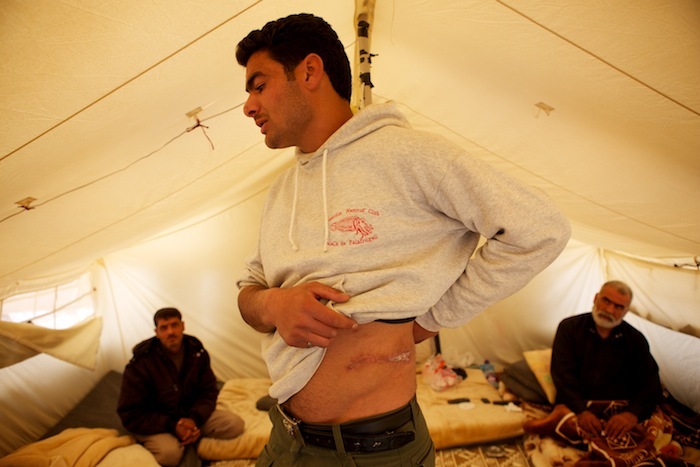 Zahy was injured by shrapnel whilst looking for food and was then shot 3 times in the same leg by snipers shortly after. Zahy (31) with his wife Nisreen (31) and their children Kenan (6), Lilyan (7) & Yousef (1.7 mnths) sheltering in a small apartment in Russeifa, 15km NW of of the capital Amman, Jordan having fled their home in Babr Amr, a district of Homs, a town north of the Syrian capital Damascus. Kenan (6), Lilyan (7) & Yousef (1.7 mnths) play outside their small apartment in Russeifa. They have no TV and don't go to school so get bored easily. Then there are the people who have deep trauma such as Ala. After his father was shot, he became the sole breadwinner on the family’s fruit and veg store but like many people his age, he was taken by the Syrian police and tortured. Four months later he was dumped on the steps outside his home a broken man. Muna said he used to be such a lively intelligent boy but he hasn’t spoken a word since and is terrified every time someone arrives, thinking they are about to take him away again. 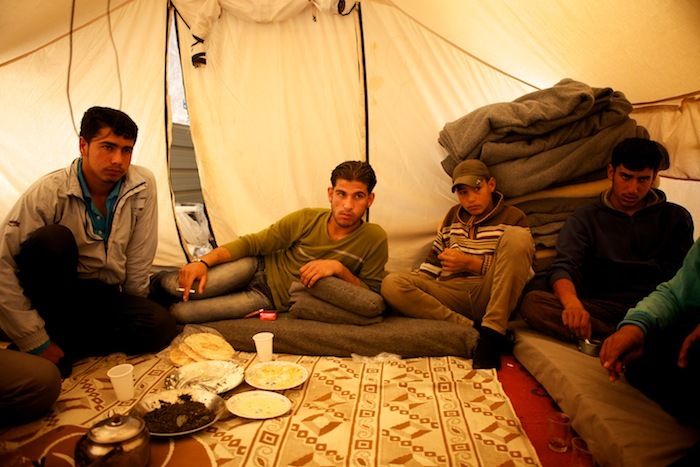 They have sought shelter in a Palestinian refugee camp on the outskirts of Amman which is one of the cheapest places to find accommodation. They have received non food items from Act for Peace partners, the neighbours are helping out and her two eldest sons wash cars and earn about 3USD a day but it isn’t enough to survive. Muna said she hasn’t paid any rent and is living off the good will of the owner. Ala (25) was taken by the Syrian army for 4 months and tortured. He was eventually dumped back outside his family home. He used to work in a factory making drapes but is now severely traumatised and unable to communicate or work. He hasn't spoken since he returned and wakes up screaming and hits his head. 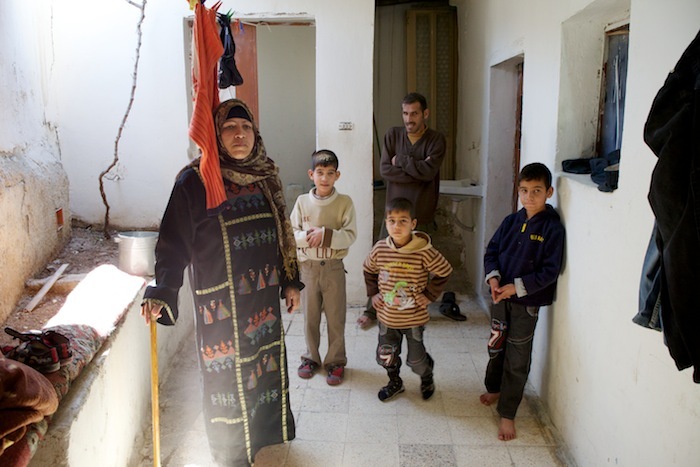 Muna (40) with her sons, L-R Fadi (7), Ala (25), Basheer (5) & Hussien (6 ) in a small apartment in Russeifa, 15km NW of of the capital Amman, Jordan. They fled their home town of Daara in southern Syria 3 months ago after their house was bombed. 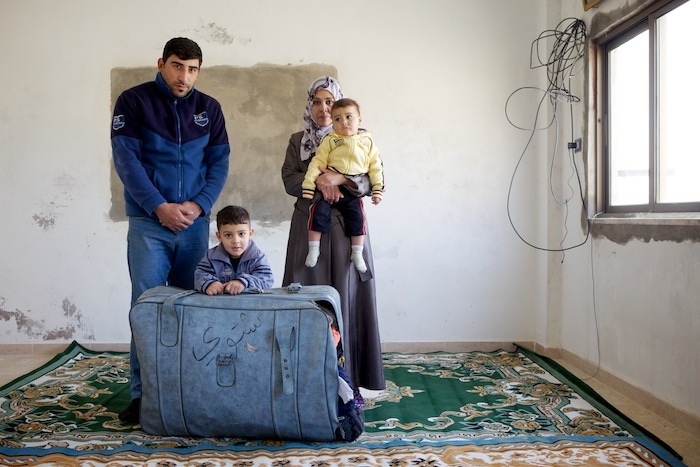 What really brought home the human cost of the Syrian conflict was the simplicity of seeing a tattered old suitcase that contained the entire possessions of a family. Like all other refugees, Ala’a (29), Zeena (26), Ammer (4) & Mohammed (1) only managed to bring what they could carry across the border, so they arrived with just some baby food, nappies and their clothes in this suitcase. An ordinary, hard working family who once had their own bakery business, a family home, a car, who enjoyed holidays and had hopes for the future for themselves and their children but ended up having their entire lives destroyed during the conflict. I asked them if they ever expected they would be in this situation. The both looked at each and laughed. Zeena told me they had seen the demonstrations on TV but never thought it would effect them directly. They never thought they’d end up as refugees. 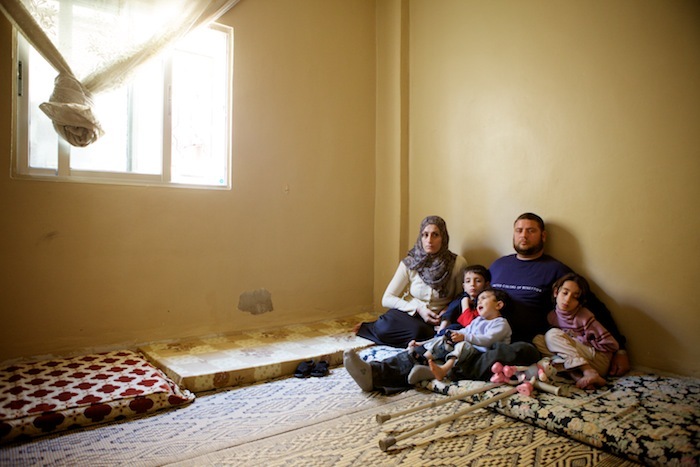 Alaâa (29), Zeena (26), Ammer (4) & Mohammed (1) fled Homs a month ago and are now living in this single room in Amman. They hope to return home one day. These are just some of the many individual stories of people affected by the violent conflict in Syria who need assistance. Ordinary people who are now trying to survive in an extraordinary situation. For further information or to make a donation to the appeal please visit the Act for Peace website here. In March this year when on assignment in Jordan for aid agency Act for Peace there was much press coverage on the millionth refugee to have fled Syria. Less than six months on the deplorable milestone of two million refugees has now hit the headlines. 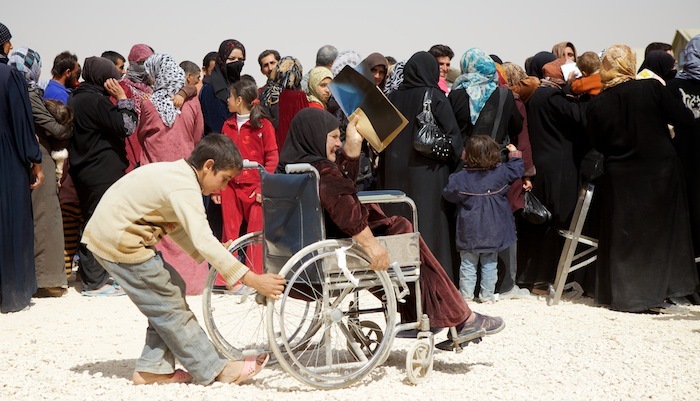 The devastating impact on everyday Syrians can be seen most visually in the harsh desert refugee camp of Za’atari. Now hosting up to 120,000 people, it’s the second biggest refugee camp in the world and within just two years it’s become the fourth biggest centre of population in Jordan. 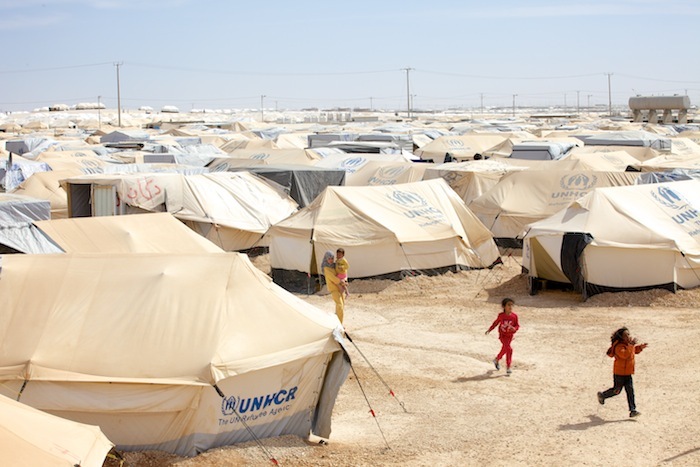 Children run between between tents in Za'atari refugee camp in northern Jordan close to the border of Syria. It's fast becoming one of the largest refugee camps in the world. 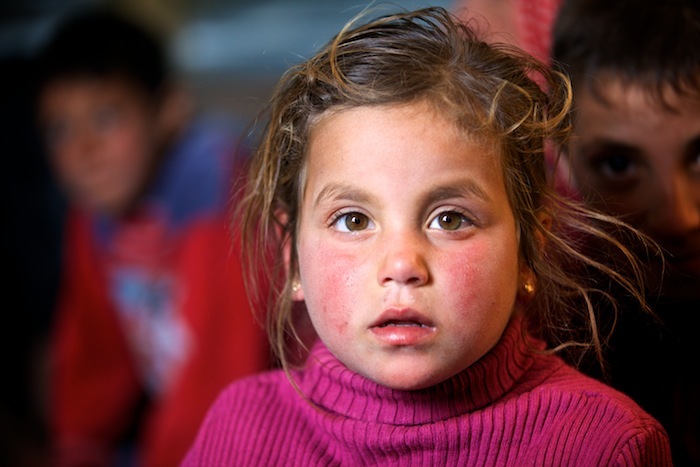 A young girl inside her tent in Za'atari refugee camp. 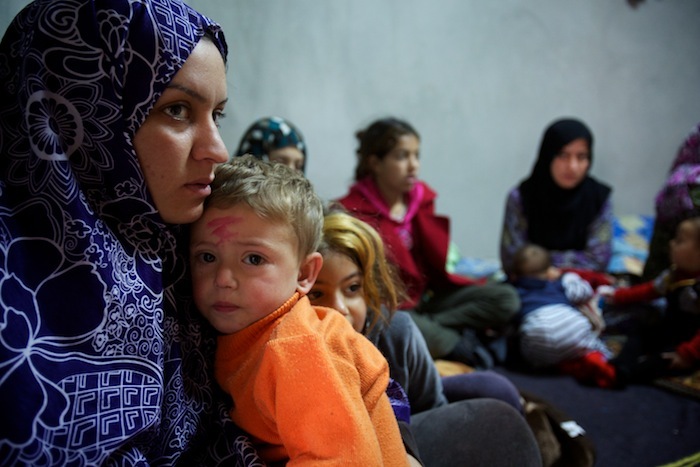 Women and children make up over half the population of the camp. Conditions in the camp are brutal. In the summer temperatures soar over 40c and in winter the nights are freezing. 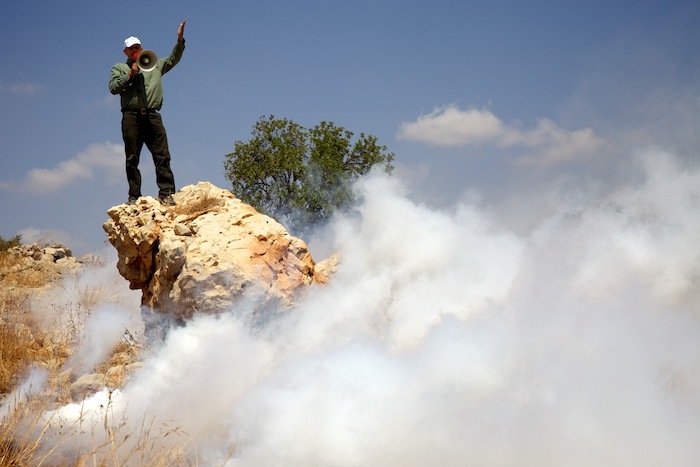 An interminable wind whips up a clingy white dust that results in chronic respiratory and eye conditions.Millions of litres of water have to be trucked in everyday and bread and other essentials are often in short supply, leading to regular riots. Whole extended families sleep together in row upon row of tents with privacy non-existent. Boredom and fear of the future has replaced a life they have left behind. 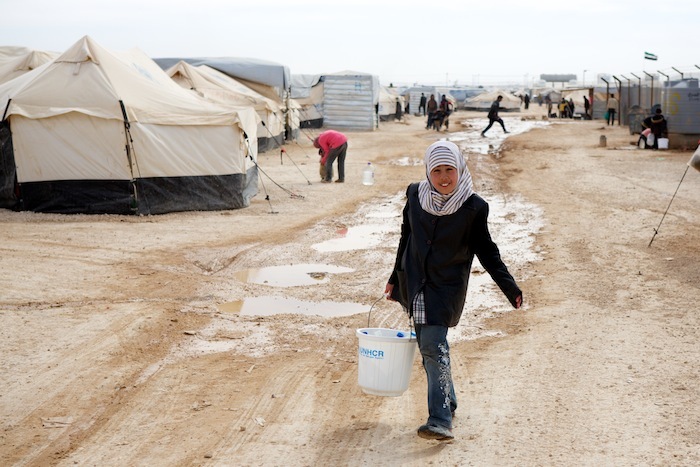 A young girl carries filled water bottles collected from a water storage tank in Za'atari refugee camp. One of the biggest issues in the camp is the availability of fresh clean drinking water. 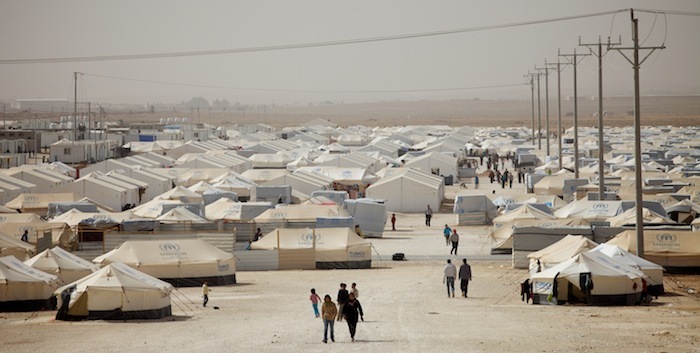 People walk between closely pitched tents in Za'atari refugee camp. Aid agencies like Act for Peace and UNHCR are doing their best to provide the basics such as shelter, food, water and medical support but with a shortfall of funding and thousands of people arriving everyday, trying to meet their needs is extremely challenging. Filling in the gaps are entrepreneurs who line the main street selling goods and services from ice creams, to electric fans to haircuts, all of which is encouraged by the camp management to help create a sense of ownership and community. 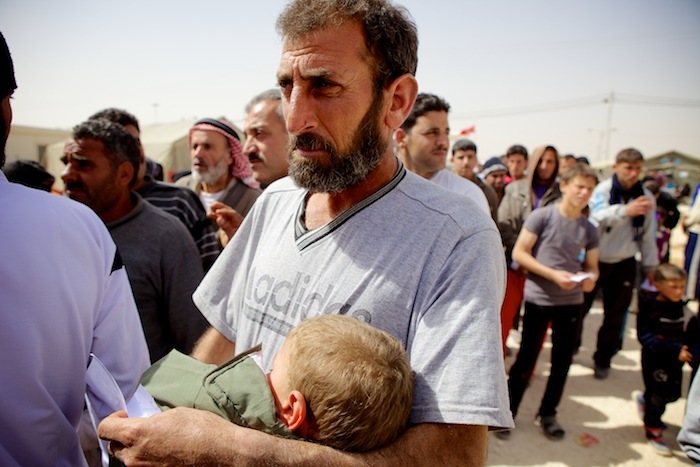 A Syrian refugee waits in line with his sick son at a crowded medical centre run by the Moroccan Army in Za'atari refugee camp. A young boy pushes his sick mother across rocky ground at a crowded medical centre run by the Moroccan Army in Za'atari refugee camp. What shocked me the most is the lack of law and order in the camp. There are Jordanian police on the gates and patrolling the perimeter but this is a closed camp so leaving requires special permission, bribery or the occasional good will of the gatekeepers. Police rarely venture into the camp itself and when they do it‘s often in riot gear and armoured vehicles. You get all the social problems of criminality and gender based violence you’d get in any big city but this is exacerbated by the containment and hopelessness of the situation. 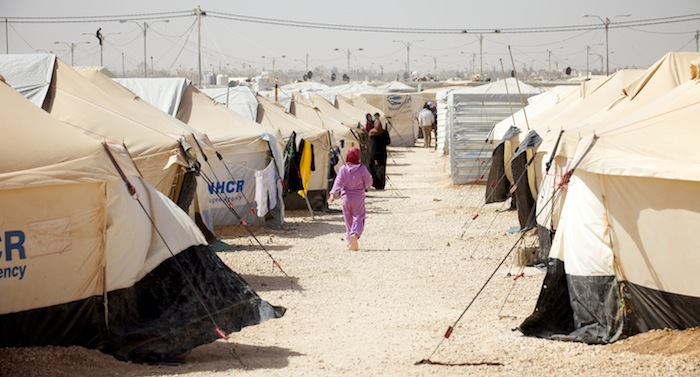 The sprawling Za'atari refugee camp. Working as a photographer and shooting video in this environment certainly has its challenges. Out of all the refugee camps I’ve worked in over the years, Za’atari is one of the most chaotic and confrontational I’ve been to. There’s an underlying air of tension as people try and eke out whatever existence they can. If you drive, your vehicle is usually stoned. If you walk, an angry group often mobs you, venting their frustrations and asking for assistance. Then you have the children, scarred by unimaginable experiences, who express their frustrations and confusion through violent actions. Zaher, a Jordanian who works with a partner agency and I had just finished interviewing a family and were about to leave when a group of children came up to us asking for pictures. One young boy alternated between being very happy and smiling then quickly becoming very aggressive and back again. Sensing that the situation was escalating with more people crowding around us and quickly becoming out of control we decided to leave. As stones started being thrown at us, we walked towards the main road. Now surrounded by an angry crowd, Zaher started translating some of what was being said, none of which was encouraging. Then some random guy saunters up to us, chatting away in English, asking where we were from as if nothing was happening. This seemed to have a calming effect on everyone as the crowd disappeared as quickly as it had formed. It was a tragic example of how children are bearing the brunt of this conflict, their erratic behavior a symptom of the trauma they have experienced and the insecurity of their current existence. Many children are traumatised by what they have seen. 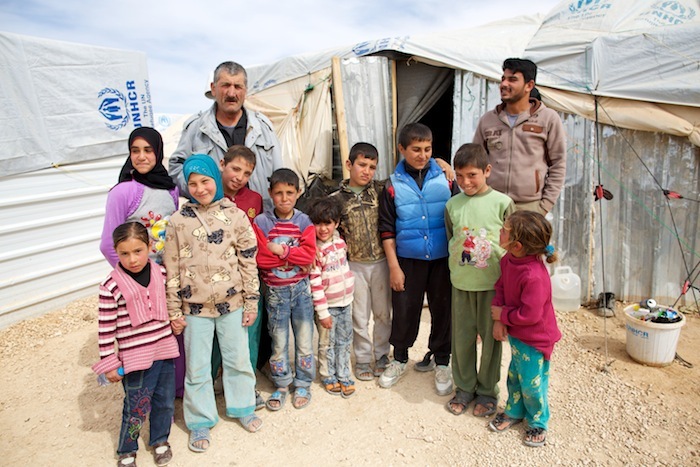 The UN estimates that of all the refugees, one million of them are children, with most being under the age of 11. This is why, along with supplying hygiene kits and blankets and food parcels, Act for Peace and their partners are supplying school uniforms so children can attend the UNICEF run school in the camp. The uniforms not only enable them to continue their education but they also bring some sense of normality to what is a chaotic and frightening time. One of those students I met was 16 year old Hana, a very energetic and bright girl who had to flee her town of Daara in the south of Syria. She was telling me about how her home was destroyed by artillery during fighting and members of her family were kidnapped and tortured. Like most refugees, she had an incredibly dangerous and traumatic journey to reach safety in Jordan. For the past year she has been living in this tent in Zaatari camp with her mum and dad, 4 brothers and two sisters with no hope of returning anytime soon. Hana (16), who fled her home town of Daara in southern Syria after her house was bombed and some of her relatives tortured, standing outside a tent in Za'atari refugee camp in northern Jordan where she lives with her family of mother and father, 4 sisters and 2 brothers. 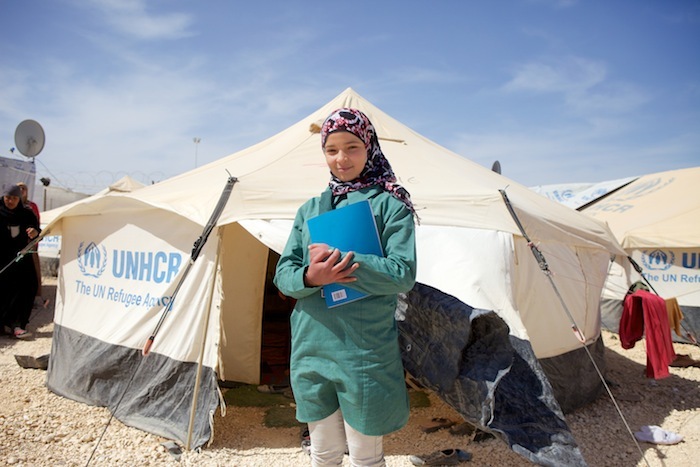 Education is a long term peace building strategy and UNICEF warns that there is fast becoming a “lost generation” of child refugees ill-equipped to help rebuild Syria in the future. So when the fighting stops, Syria will face huge challengers to rebuild itself so an educated younger generation like Hana will be essential to enable that to happen. 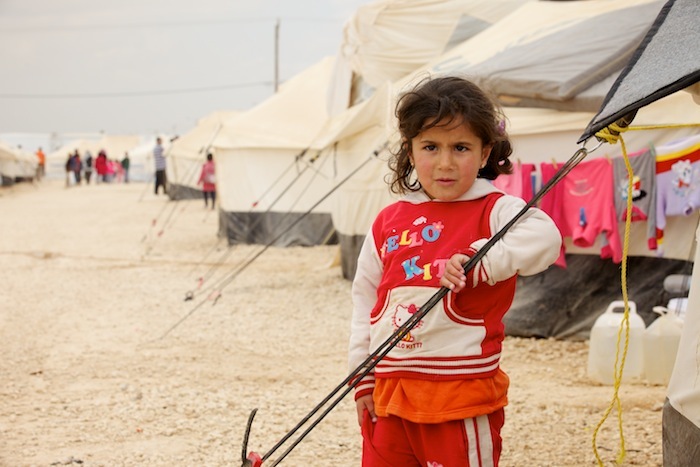 A young girl outside her tent in Za'atari refugee camp in northern Jordan close to the border of Syria. As part of my ongoing project looking at how separation walls in intractable conflicts such as Northern Ireland, Cyprus and Israel/Palestine, contribute to being both physical and psychological barriers to a positive peace, I’m very happy that the section on the Israel-Palestine Separation Barrier is being exhibited at the Australia National University in Canberra as part of the Human Rights in Palestine Conference 2013. There are some excellent speakers lined up and I’m sure it will create some intense discussions. If you’d like to see the exhibition it’s running from September 11-12th at the ANU Commons centre and is open to the public. Details of the Human Rights in Palestine Conference 2013 can be found via the LINK. Physically separating conflicted communities continues to be a policy decision by many governments around the world in an attempt to curb violence. 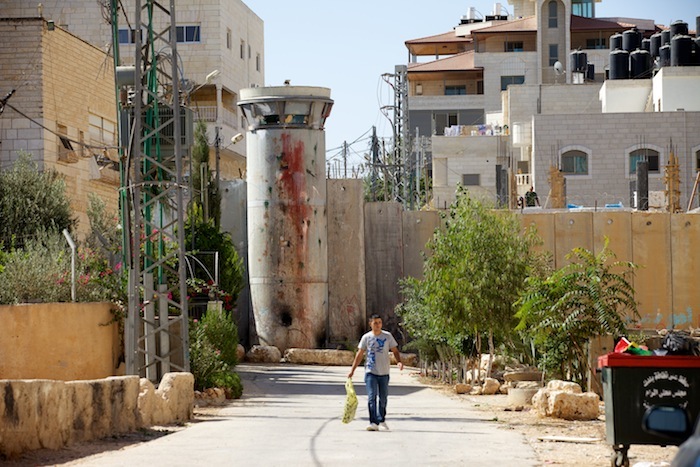 These separation walls become highly politicised and are a physical manifestation of failed policies to overcome the root causes of each of these conflicts. 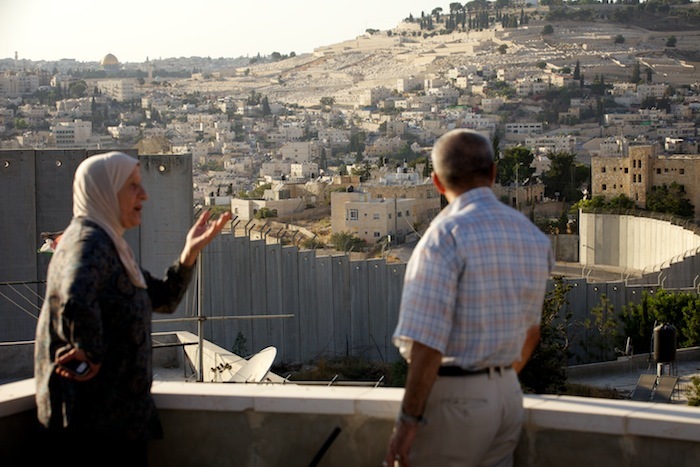 One of the most controversial of these recent structures is the Separation Barrier between Israel and Palestine. Over ten years of construction, it has created ‘facts on the ground’ that have dramatically impacted Palestinian society and its economy. Israel states the barrier is there for security reasons and was built in response to a spate of suicide bombings in Israel. The Palestinians say it’s a de facto border and land grab. 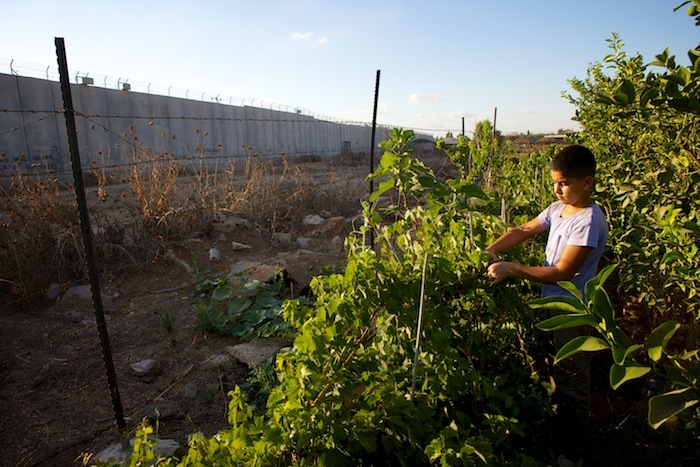 Approximately 15% of the wall will be built along the internationally recognised Green Line with the remaining 85% built inside the West Bank resulting in some of the most fertile land and water sources becoming almost inaccessible to Palestinian farmers and communities. 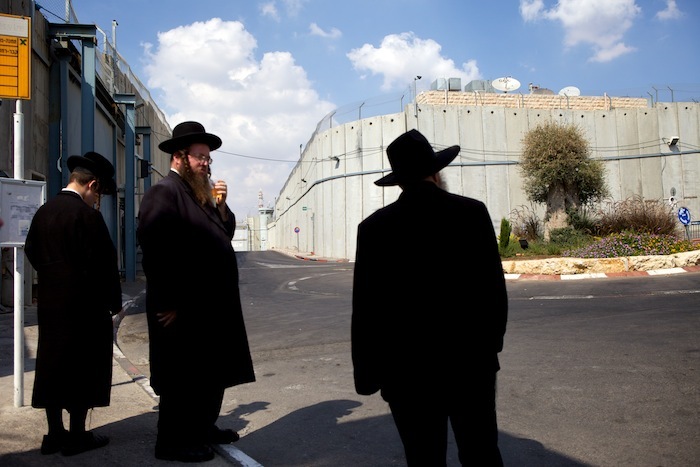 The wall separates Israel from Palestine but it also runs directly through many Palestinian communities, dividing families and economically severing once sustainable businesses. 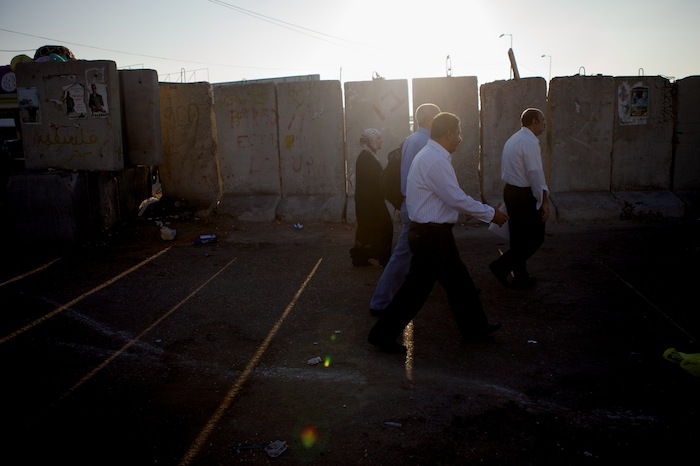 It’s not only the physical wall that has become a barrier to rights of passage. 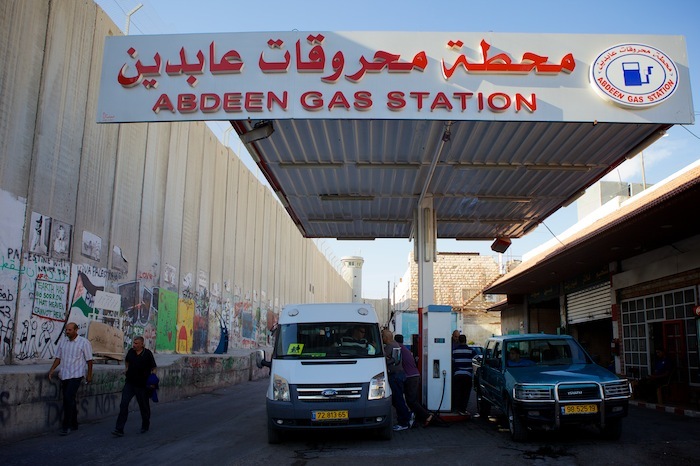 A complicated and bureaucratic permit system also stops thousands of Palestinians daily movements, severely impacting access to farm land that lie on the ‘wrong’ side of the wall or to employment opportunities within Israel. Whilst these physical barriers arguably may provide short term gains in security, they are ineffective as long term solutions to creating a sustainable positive peace. Whilst resolutions to the conflicts are sought, the most affected by these policies are the people who live in their shadow, their lives are shaped by their presence, creating both deep physical and psychological challenges for residents. The impact of the wall on a personal level can be seen in this exhibition through personal testimony from Palestinians who suffer the daily indignity of having to pass through the overcrowded check points, lost hours of productivity waiting for gates to open, the high unemployment rates within the West Bank and the frequent demonstrations against the wall. 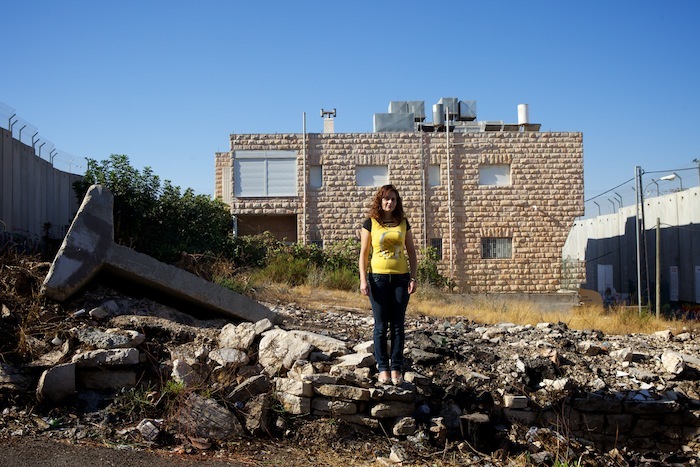 The exhibition forms part of an ongoing project looking at how separation walls in intractable conflicts such as Northern Ireland, Cyprus and Israel-Palestine, contribute to being both physical and psychological barriers to a positive peace. However, for some communities these walls provide the desired protection and a reassuring knowledge that they are separated from ‘the other’, whom they have come to fear. It many cases these walls were quickly constructed during times of violence. They may end up being one of the last structures to come down to enable peace. One of my pictures from South Sudan shot for Cafod has been recognised as a Nominee at the 6th Annual Photography Masters Cup. I was more than happy about this as South Sudan is one of those places that gets under your skin and you just want to revisit. 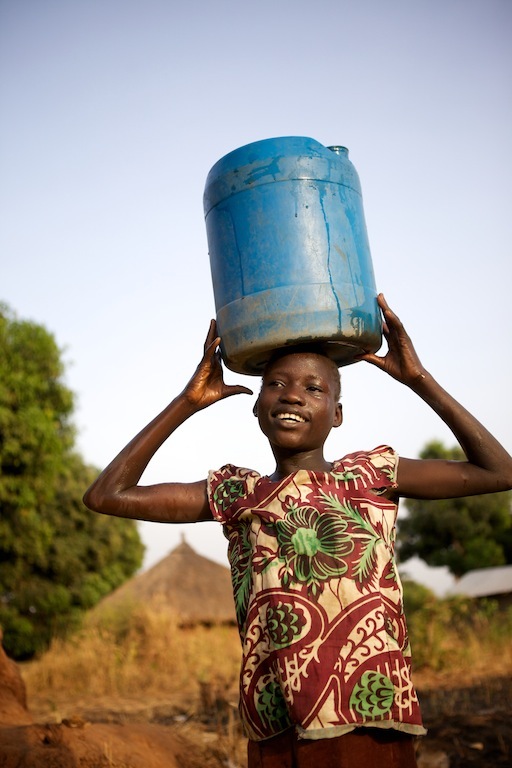 The picture shows Mercy (12) who collects water for her family every morning and evening from a borehole installed by Cafod. Fresh clean drinking water is one of the many challengers facing the Republic of South Sudan, the newest nation on earth. Before the new borehole was placed within her community of St Cecilia, home to over 400 households or approx 3.000 people, Mercy would have spent hours walking miles to gather water , impacting her ability to attend school and her future. Mercy (12) a community member filling up jerry cans of fresh clean water from the Cafod borehole. Caritas Australia who I’ve worked with a number of times have launched their 2013 Project Compassion profiles which showcase outstanding examples of how development can initiate positive change for individuals and communities. I was lucky enough to report on one such person called Raymundo (24) in Bolivia. 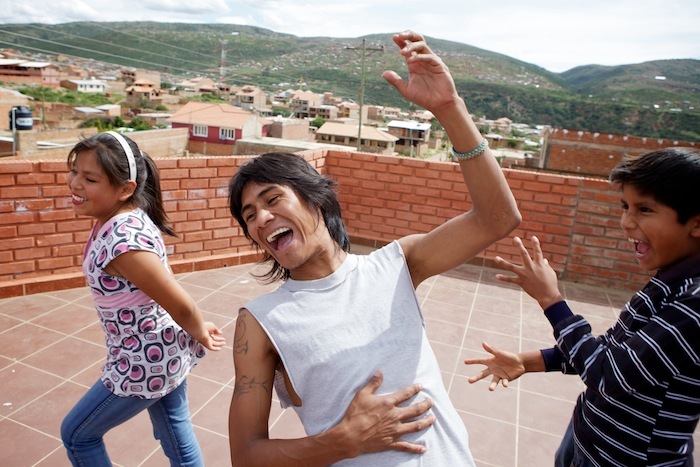 An incredibly energetic and charismatic guy whose life story is an inspiration to many underprivileged children in his home town of Cochabamba. Having a difficult start in life he has gone from street child with addiction issues to gaining a degree at University and a passion for helping others who face the same problems he managed to overcome. This was made possible through a local NGO called Educar es Fiesta (Education is Celebration) a circus school for vulnerable children who rescued him from the streets and gave direction to his life. He is now a teacher there and has gained a celebrity like status with the children..! 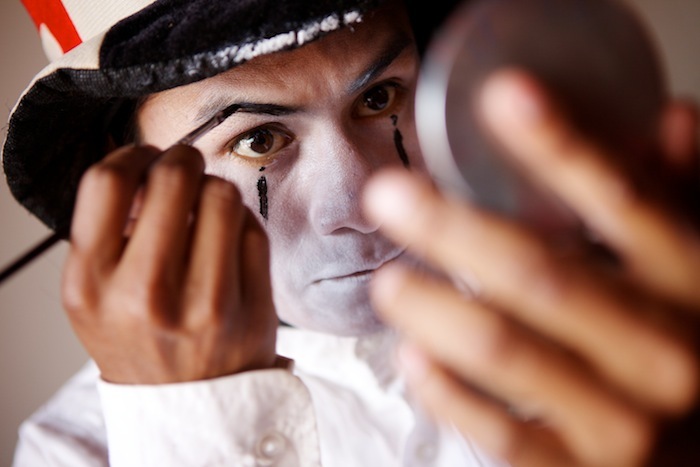 Raymundo Ramos (22) has been with Educar es Fiesta, a circus school based in Cochabamba, Bolivia since the age of 9. Here he is teaching children acting and circus skills on the roof of Wasy Tukuypaj. The Educar es Fiesta centre called Wasy Tukuypaj which means 'House of All' in local Quecha language in San Francisco area of Ushpa Ushpa. The town of 50,000 people has a large migrant population so many of the children have never grown up with their parents. They located here due to the high number of parentless children. 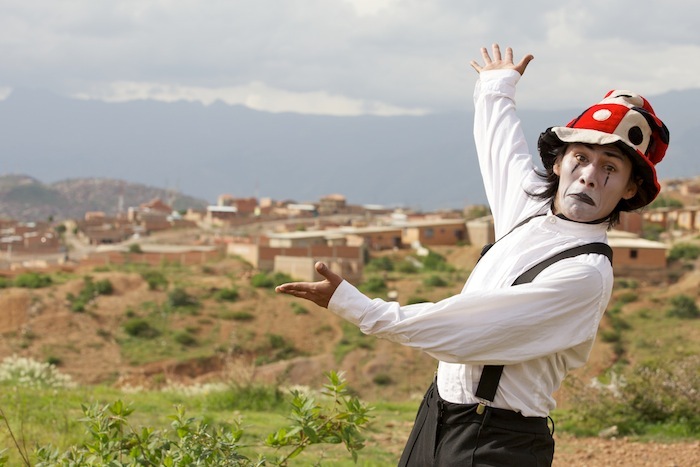 Educar es Fiesta which means Education is Celebration is a circus school based in Cochabamba, Bolivia. Its primary role is to assist children at risk though the prevention of violence against children. It runs circus and art classes and education lessons for children aged 8-16. They also work with parents and teachers informing them about child rights. Over 1,500 children have participated in the program since 1999. I was able to make a short trip back to Israel and Palestine in September to continue my long term project on communities divided by separation barriers. Everytime you visit this region something has changed, not usually in a positive way, and this trip was no exception. It terms of trouble and violence it was probably the quietest time I’ve experienced there. The usual Friday protests were still happening in Ni’lin and Bil’in but with much reduced turnout and it was unusually calm yet tense on the streets, as if everyone was waiting for something to happen. Well that calmness was certainly broken with the latest confrontations in Gaza which has led to widespread unrest throughout the rest of the West Bank. As for the Separation Barrier, it continues to be a major obstacle to the peace process, whatever remains of it, and to the day to day lives of people who are surrounded by the barrier. The aim this time was to meet a number of people who have been directly affected by the walls construction. I’ll be heading back to this region again soon and will spend more time meeting Israeli residents to hear what the wall means to them. Here are a few images from that trip and a brief synopsis behind the concept of this project. Walls are highly political and represent the physical manifestation of failed policies to overcome the root causes of each of these conflicts. Whilst providing short term gains in security they are inevitably ineffective as long term solutions to creating a sustainable positive peace. Whilst resolutions to the conflicts are sort, the most affected by these policies are the people who live under their shadow. Daily lives are shaped by their presence creating both deep physical and physiological challenges for residents. It may mean walking extra miles to go to the shops, the fear and indignity of passing through checkpoints that separate family and friends or even just the sheer physical presence of such structures in their back yard. However, to some communities they provide the desired protection and a reassuring knowledge that they are physically separated from ‘the other’. 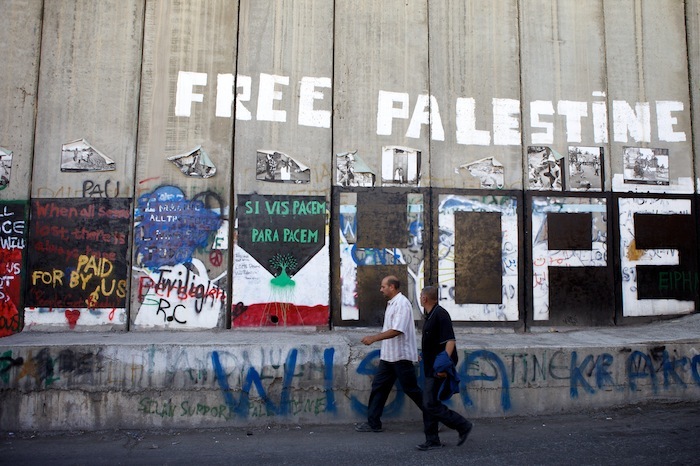 Walls are a symptom of conflict, not a cause. It many cases they are the first thing to go up during times of violence. They may be the last structures to come down to enable peace. The separation barrier in Bethlehem. In many areas, the wall is constructed in what used to be lively commercial districts. Many businesses now struggle to survive as demand has dramatically reduced. Hani Amer (55) who has 6 children and lives with his wife Munira. 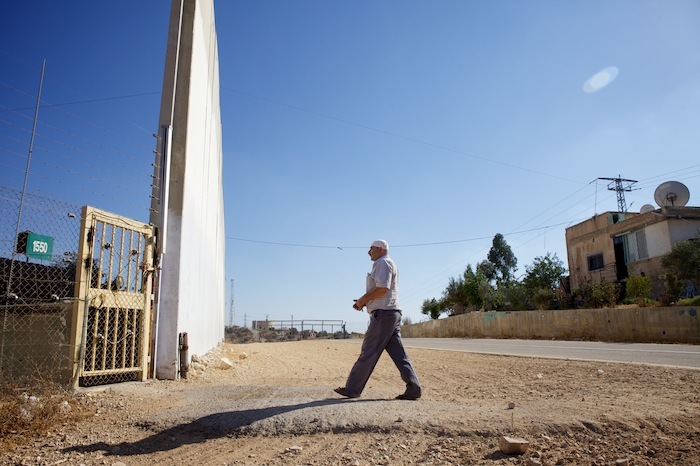 His house in which he has lived for 39 years is surrounded by the separation barrier cutting him off from the Palestinian village of Mas'ha. Behind his house is the Israeli settlement of Elkana. The concrete section of wall in front of his house serves no security purpose and Hani says was built out of spite to spoil his view. 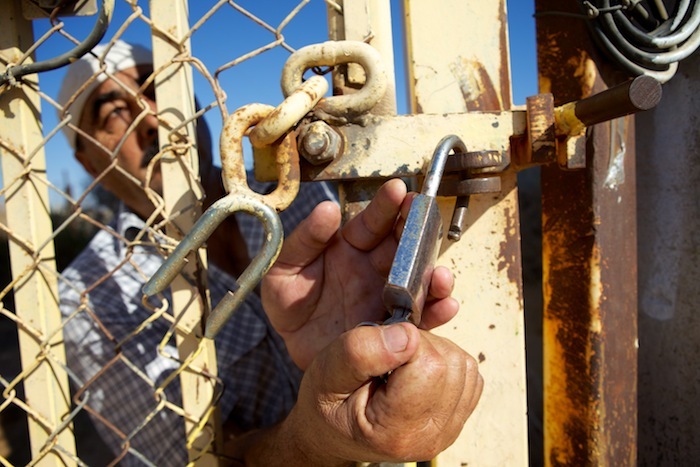 Hani Amer (55) unlocking the gate he and his family has to use to enter his property. The wall was built in 2003 and he had to fight to be given a key to the only gate that gives him access to the outside world. The wall not only divides Israel from Palestine but also separates Palestinian communities resulting in many families and friends being cut off from each other. The wall here runs directly though a Palestinian community in Ar Ram close to Jerusalem. Ali Ayyad (62) with his sister Zainab Bader at her house in Abu Dis. Ali's house can be seen just on the other side of the wall. It used to take just a few minutes to walk to each others house but since the wall was built it now takes at least 30 minutes by taxi costing $30 or 1.5 hours costing $7 by public transport. The Dome of the Rock can be seen in the background showing how close to central Jerusalem the wall has been built. 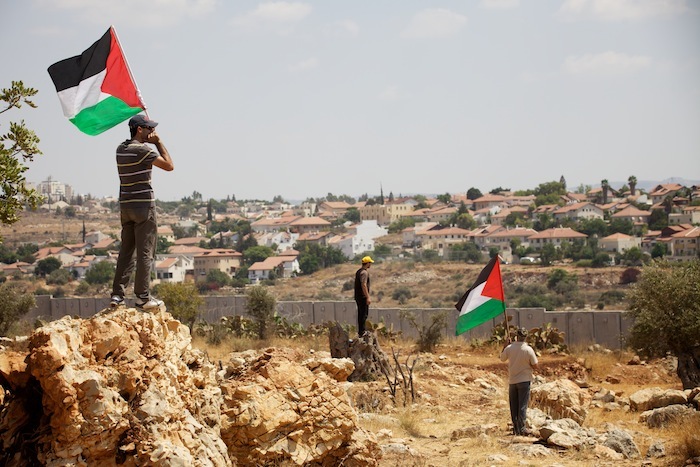 Residents of Ni'lin and supporters protest against the separation barrier that has separated them from large tracts of their valuable farming land. These protests have been held every Friday for years. 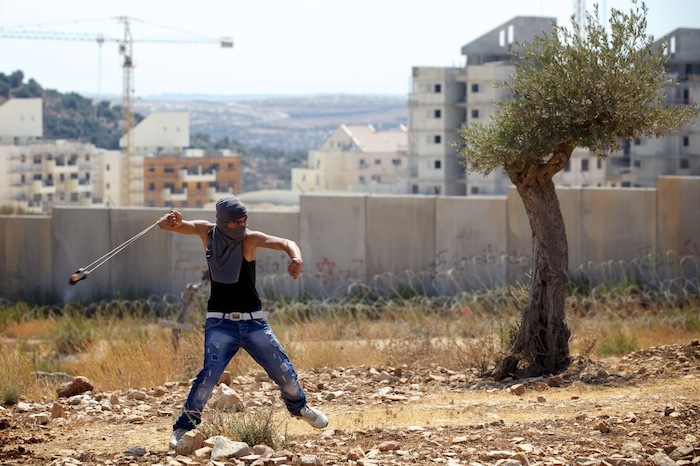 Surrounded by tear gas, a protester from Ni'lin chants through a loudspeaker towards Israeli soldiers on the other side of the wall..
A young Palestinian man uses a slingshot to aim rocks at Israeli soldiers during the weekly protests in Bil'in. The illegal Israeli settlement of Matatyaho Mezrahi can be seen under construction behind the separation wall. Mohammad Faraj (11) works on his fathers land next to the separation barrier that surrounds the town Qalqiliya. A dead zone exists next to the wall further reducing the amount of available farming land. The Wall Steakhouse which screens movies and sports projected onto the wall in Bethlehem. 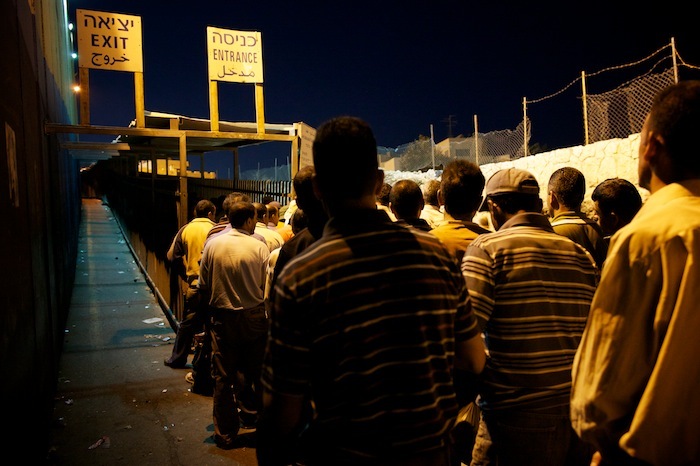 Workers wait to be allowed into Israel from Bethlehem at checkpoint 300. It often takes hours of queuing in the metal cage before they can pass through the checkpoint. Early morning at the Qalandia checkpoint, one of the main checkpoints into Jerusalem from Ramallah in the West Bank. 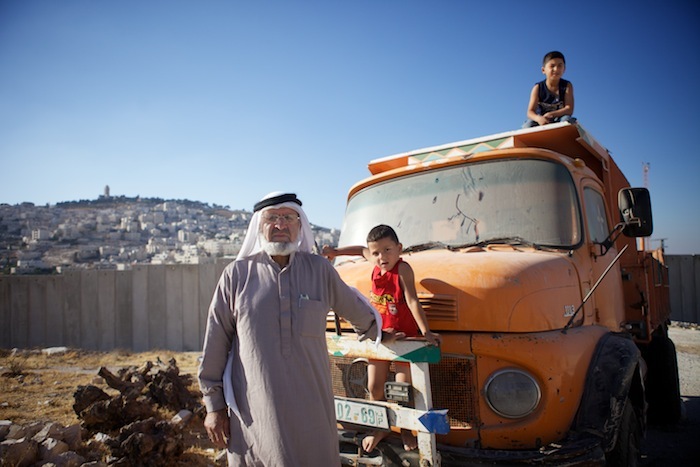 Abu Mohammad (65) with his grandsons Saed & Mohammad in his broken down truck he can no longer afford to fix in Bethany on the outskirts of Jerusalem. He used to be a driver before the wall was built 10 years ago and business was good. Now he has no access to Jerusalem and there is very little work in this area. The Walk as One, Connecting with our World’s Indigenous Peoples, campaign and documentary film was successfully launched in Sydney by Caritas Australia a few weeks ago. I thought I’d write a quick ‘behind the scenes’ post about what equipment I used, what went right, what went wrong etc etc. I’ve always found reading about these things informative so hopefully someone else may be able to pick up a few ideas/tips. There is a huge amount of information on indigenous rights on the website so if you’re interested in these issues please click here. Walk As One from Caritas Australia on Vimeo. This was the first assignment I’ve done where the intent from the outset was to produce a short documentary. On other assignments such as South Sudan, Uganda, Bangladesh the filming came secondary to the stills so the approach to this project was different in a number of ways in terms of planning, logistics and preparation. It was also the first time I’d be part of a team with Alex from Caritas producing and writing the final policy report travelling with me and a dedicated editor, James Bradley who did an excellent job and Cam Mackellar who created the unique soundtrack which just lifts the whole production. There were also translators, policy people, communications staff and everyone else involved with launching a big campaign. The trip involved two 4 day visits to Beswick, a remote community about 150km south of Katherine in the Northern Territories and a two week trip to Bolivia taking in not only the project focus of the Yuracare community in the Bolivian Amazon region but also other Caritas funded projects which provided some excellent B-roll. So what were the challengers ? In many ways filming and creating a picture essay are very similar in the sense your creating a story. However the approach is quite different. Shooting stills is a much more natural, observed way of working where you often just let things happen. With filming, you have to be much more methodical, pre visualising shots and sequences, directing the subjects at certain times with multiple takes. As a photojournalist this originally felt quite unnatural and contrived but necessary to make the film flow. Using a tripod for many shots also took some getting used to as I’d never owned a tripod before shooting video but they are absolutely necessary. I did shoot some handheld when motion was obvious like in the car but otherwise it was locked down. Audio is always a tricky one and a bit of a juggling act running a duel system but it does work well. I record all critical interviews on the Zoom and lav mic and collect as much ambient as possible. When you know that you just need a trace of ambient and the situation is moving I’ll use either the in camera mic or the shotgun mic top mounted. It would be great to have a dedicated audio person as the audio is equally if not more important than the visuals but budgets often don’t allow this. Logistically, the biggest issue we had was the shoot in the Bolivian Amazon was cut from a proposed 5 days to just 2.5 days due to funerals, weather, logistics. That could have been a major problem but you can only get what you are given. You just have to readjust the plan and make the most of it however frustrating it may seem at the time. Technical issues included my 5D melting in the heat and overuse half way through the Bolivia trip. The main board just fried due to the heat/humidity and wouldn’t film for more than 5 seconds. It still took stills but video was out. That meant I had to switch to the 1D which I hadn’t used for filming at all. However, having used this line of camera for years I very quickly got used to it which is partly why the transition from shooting stills to video using these cameras has been relatively smooth. You’re just so familiar with the equipment. -Prepare for the worst, back all your equipment up on every level in case something like, your camera melts..!..so you can continue in remote locations. At the time it seemed unnecessary to buy that 1D Mk4 Zacuto conversion kit for $100. However, it was probably the best money I’ve spent as it meant I could continue shooting seamlessly. Without it, it would have been a major issue trying to film by just looking at the back screen..almost impossible to do in a fluid and bright light situation..! -Keep lots of spare batteries on you in the bag. Not back in your room where they are pretty useless..! -Plan and prepare a script as much as possible and then prepare for it to all change. Adapt. Shoot everything you see. You can never have enough b-roll. -Shoot from as many different angles as possible to give the editor the best chance of good cuts. -Audio is absolutely crucial. As, if not more important than the images. Audio is still a foreign concept to me and most photographers so it’s by far the biggest challenge, not least running a duel system by yourself which is always a challenge. -Remember to collect as much ambient sound as possible. I sometimes forget and regret not recording even just 10 seconds of ambient which can really lift the quality of the film. -Always think about that 3 shot sequence. Wide, medium, detail to make editing easier. -Be really careful when changing lenses. Dust on the sensor is easy to fix in stills. On video, it can be a nightmare..! -Have lots of CF cards. Interviews and long sequences can eat up the memory no end. -Power bars and water. When the pressure is on, it’s 38c, humid, mosquitoes, nothing is going right, your equipment fails etc etc the last thing you need to be is hungry and thirsty. Look after yourself and the team. -Leave plenty of time. Filming takes an enormous amount of time and resources so prepare and plan for that. I love the challenge of experimenting with new media and equipment and I’m happy with the final result. You learn by your mistakes and I’m continually looking at DSLR training sites/blogs etc for new ideas and tips to improve. Now I’m just looking forward to the next opportunity..!! I finally made it back to Belfast last week to continue my long term project on Borders and Barriers. My visit coincided with the annual July 12th Protestant Orange Order celebrations which see thousands of Orangemen, marching bands and supporter’s parade through Belfast commemorating the Battle of the Boyne in 1690 where the Protestant King William of Orange defeated the Catholic King James. It’s a highly contentious time of year where some parades march through predominately Catholic areas creating friction and often violence between the two still deeply divided communities.The major flash point of Ardoyne in north Belfast once again saw rioting. Below is just a small selection of images and I’ll be following up by building on the multimedia project having also shot some video and recorded many interviews. Belfast was once again an intriguing place to work, full of very colourful characters with quite incredible histories who are now working towards creating a more peaceful future. There is still some way to go, however great progress has been made. 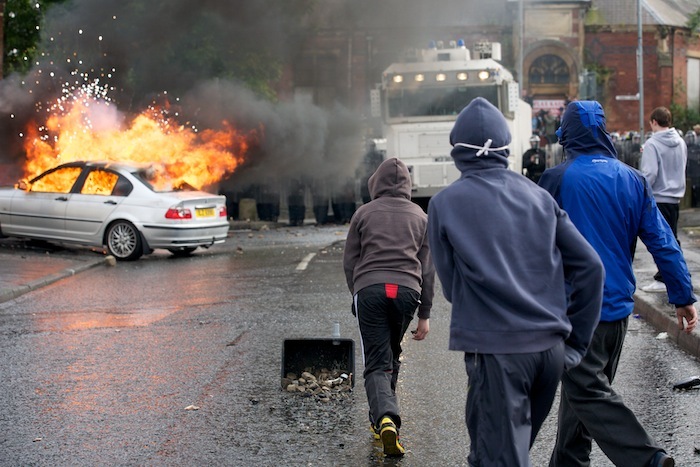 Youths rioting in Brompton Park, a Catholic area of Ardoyne in north Belfast following the annual Orangemen parade past the contested Ardoyne shops on July 12. 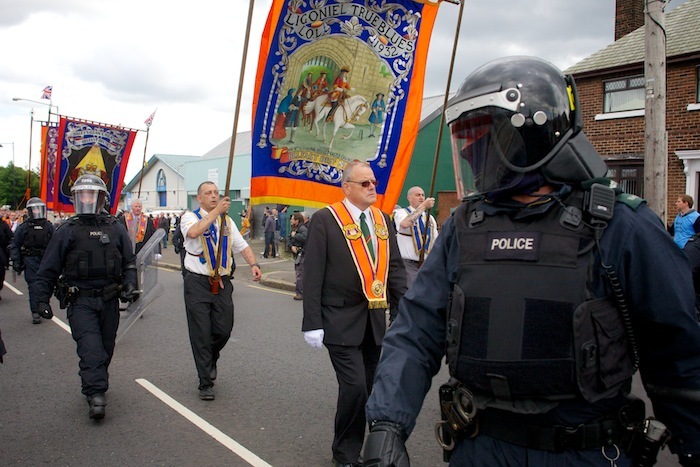 A much smaller group of Orangemen than usual parade past the contested Ardoyne shops in north Belfast surrounded by PSNI riot police during the annual July 12th parades. 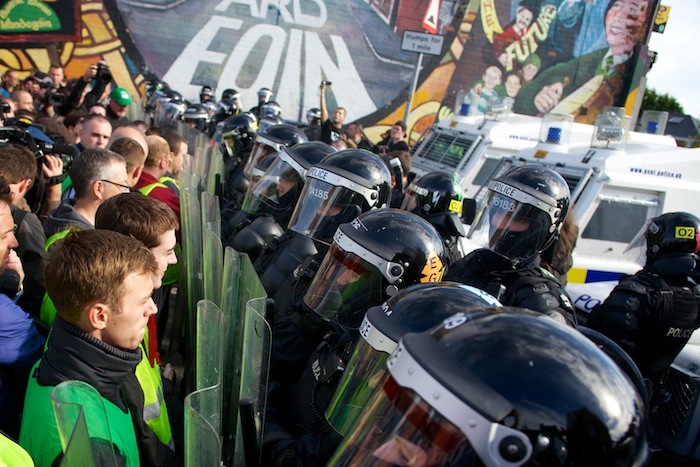 PSNI riot police stopping Greater Ardoyne Residents Collective members from staging their own counter parade. They were eventually let through which led to brief but violent clashes. 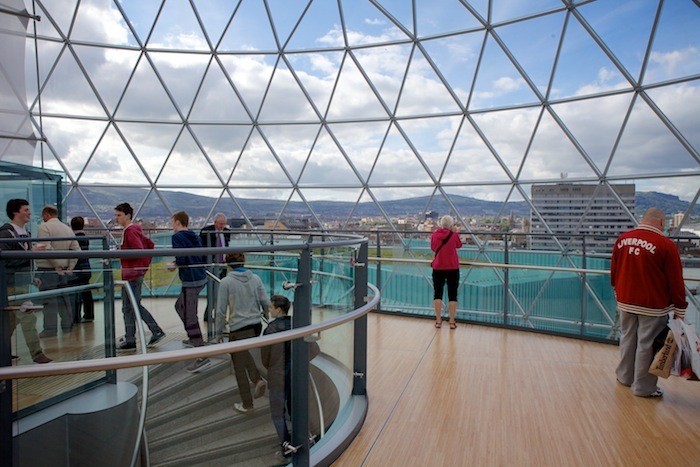 The peace dividend has paid off in central Belfast with many new shopping centres such as Victoria Square. They serve as a shared or at least neural space generally free from sectarian divisions. The same cannot be said for the majority of interface areas which saw most of the violence during the conflict but have received very little since the peace signing. Here the Cupar Way peace wall seen from Conway Street, Loyalist Shankill Road area, West Belfast. Behind the wall is the Catholic side of Conway Street in the Clonard area, some of the most deprived wards in Belfast. This is the longest peace wall in Belfast and one of the first to be put up separating the Protestant Shankill Road from the Catholic falls road. 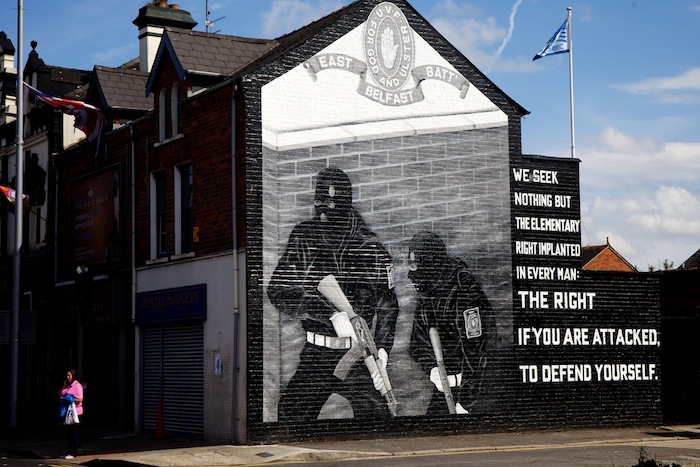 An Ulster volunteer Force mural in a Loyalist area of East Belfast. Reminders of the conflict are omnipresent including the demarcation of territory through the use of flags and murals which often show allegiance to various banned paramilitary groups making life returning to normality difficult. 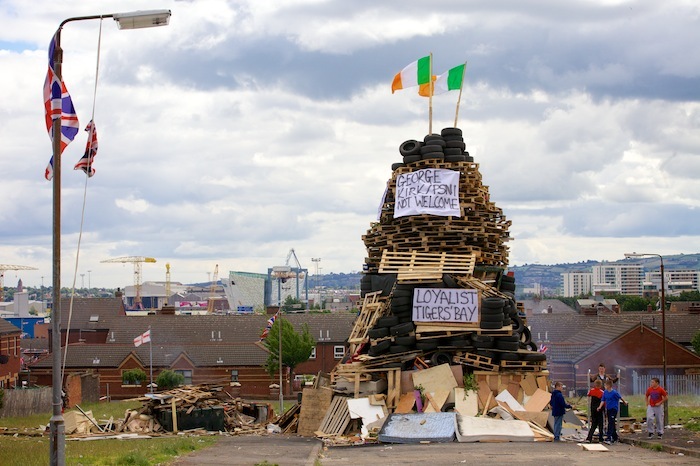 A bonfire in Lower Shankill, West Belfast. 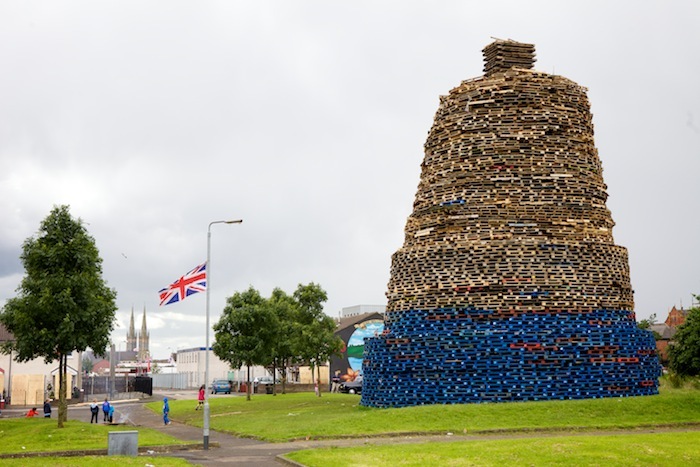 Huge bonfires are constructed in Loyalist Protestant communities in Belfast for burning on the Eleventh Night, the eve of the annual July 12th Orange Order celebrations. 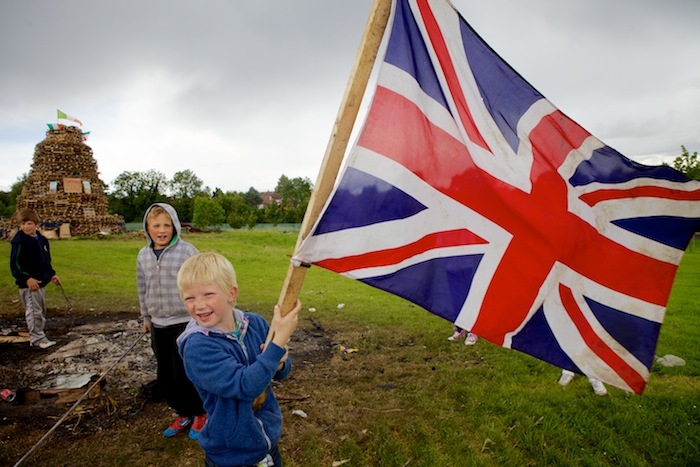 Children fly the British flag whilst protecting their bonfire in Suffolk, a Protestant enclave in the Catholic dominated area of South Belfast. A bonfire in Tigers Bay, north Belfast which is one of the most underdeveloped wards in Belfast. 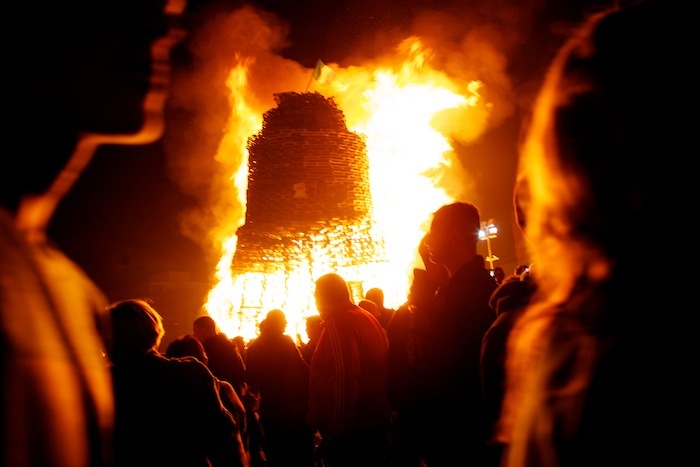 The Irish tricolour flag is often placed on top of the bonfires for burning as well as other sectarian symbols and banners which creates tensions between the two communities. Signs of allegiance come in all forms including mobile phone covers. 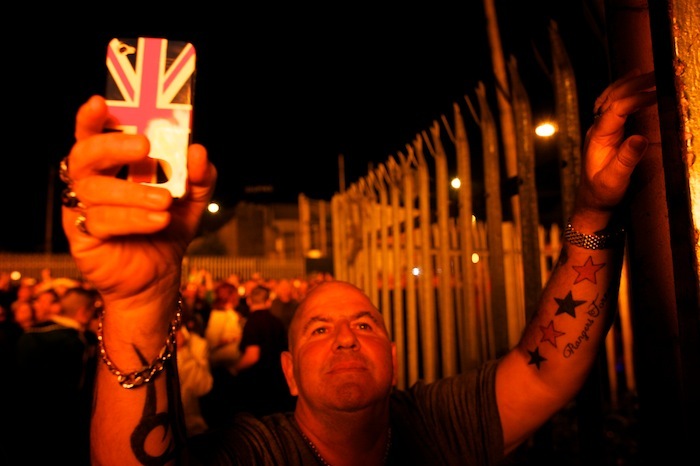 A Loyalist at the Sandy Row bonfire in central Belfast. Loyalists celebrate the burning of the Sandy Row bonfire and Irish tricolour flag on the Eleventh night. 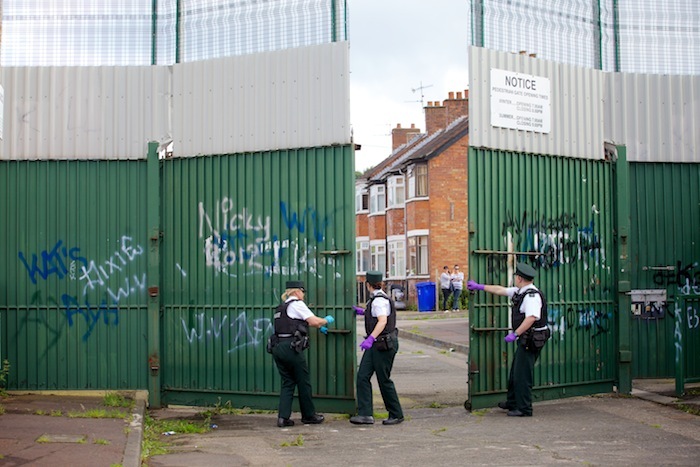 The Workman Avenue peace gates are only opened twice a year by Police to allow the contentious Protestant Orange Order Whiterock feeder parade in West Belfast to pass through them. The parade passes along the mostly Catholic nationalist Springfield Road interface and through the Workman Avenue peace gates then onto Shankill Road. Whilst violence at this parade has reduced over the years it does set back community relations. 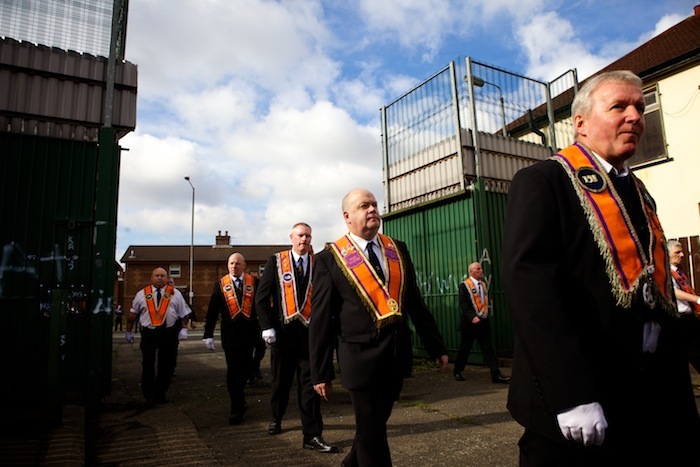 Orangemen pass through the Workman Avenue peace gates. The Springfield Residents Action Group staged a peaceful protest under a heavy police presence. Ambulatorio, an art based peace building initiative between the peace gates on the Flax Street interface in North Belfast. 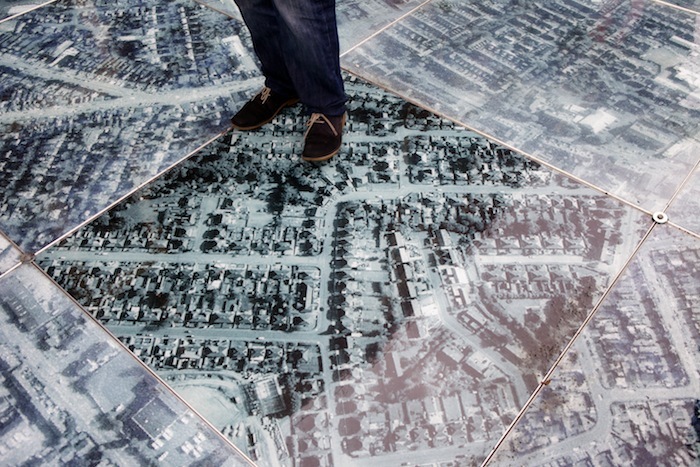 Artist Oscar Munoz has laid down panels of aerial pictures of north Belfast between the peace gates which will be opened for a short time allowing community members to cross the interface through this route for the first time. 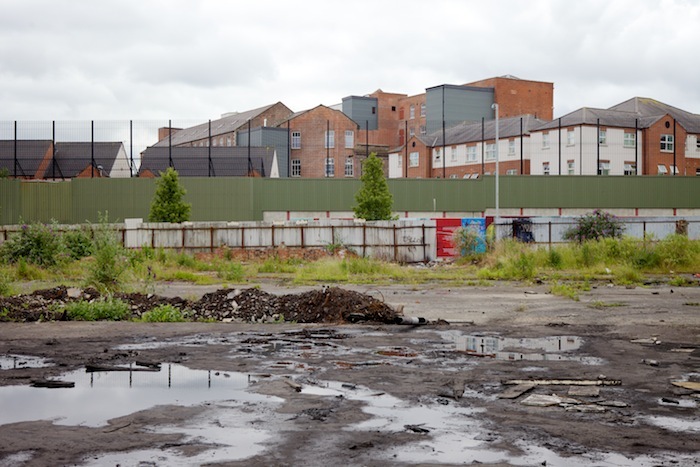 A confidence building concept, the installation invites residents to imagine walking around a north Belfast free of walls and gates. A last minute email from the Burmese government stating I’ve been granted an official press pass even though the elections are in 5 days, a few beers with photographers in Perth that night encouraging me to go..8 hours later catching a flight to Bangkok to pick up a visa arriving in Rangoon (Yangon) 8am on Saturday. No sleep, little research and first time in Burma so challenging but not unusual for a news story. Luckily found an english speaking driver who knew the story so headed straight to the National League for Democracy (NLD), Aung San Suu Kyi’s party, in Rangoon for some info then a crazy 3 hour drive following her energetic supporters to her chosen constituency in Kawhmu south west of Rangoon. Had to return that night to recharge batteries etc as totally unprepared for an overnight so in hotel at 11.30pm and gone again at 2.30am. Lots of local and international press at her house to see Aung San Suu Kyi leave to meet her supporters at 7am and another frantic 4 hours as she visited polling booths around Kawhmu. Leaving the media circus it was time to concentrate on the elections themselves visiting voting stations throughout Kawhmu and Rangoon. Media restrictions stated you could not photograph within 500 yards of a polling station but after visiting more than 20 I found two that due to local officials who either didn’t understand the law or decided it wasn’t appropriate (I hope it was the latter) let me in to document Burmese people voting in only the third election to be held in Burma in the last 50 years. Quite a moment for all which was embraced by young and old. As far as I could see it seemed very well organised, consistent throughout each station and transparent. This was obviously only a very surface and brief view of the elections so lets hope that nothing untoward comes to light over the next few days. If the official results confirm what the NLD are stating then it has been a resounding victory for them and Aung San Suu Kyi. 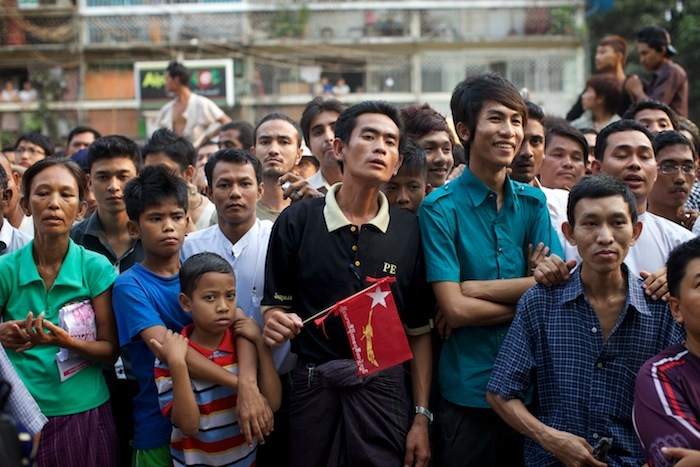 The future of Burma is now in many ways as unpredictable yet optimistic as it has been for many years……. National League for Democracy (NLD) leader Aung San Suu Kyi surrounded by her party aides leaves her home in Rangoon (Yangon) to travel down to Kawhmu on the eve of the by-election. 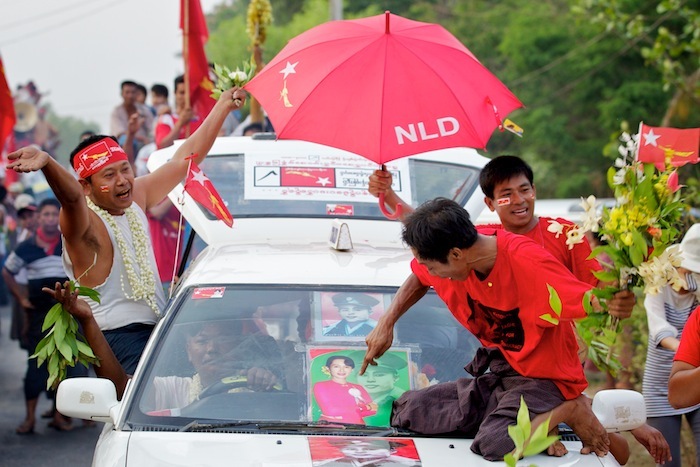 National League for Democracy (NLD) supporters travel from Rangoon (Yangon) to Kawhmu, south west of Rangoon (Yangon) where their leader Aung San Suu Kyi is standing in the by-election. 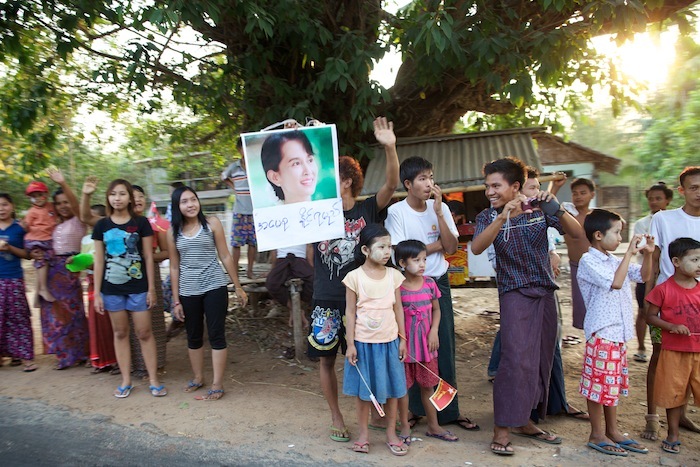 Villagers along the road show support for NLD supporters travelling from Rangoon (Yangon) to Kawhmu, south west of Rangoon (Yangon). 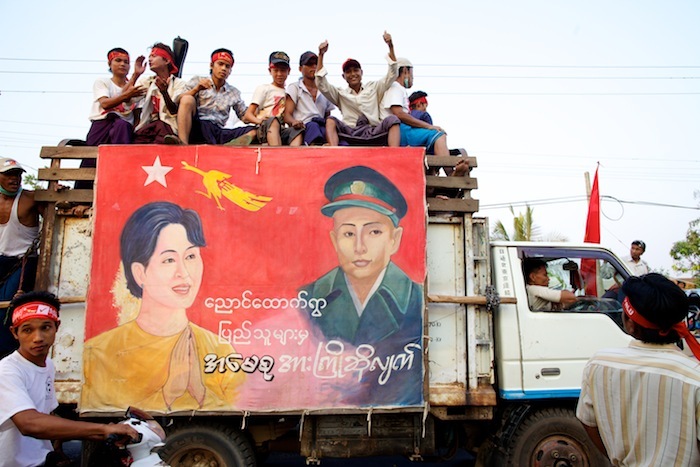 NLD supporters travel on a bus with a painting of Aung San Suu Kyi and her late father Aung San. 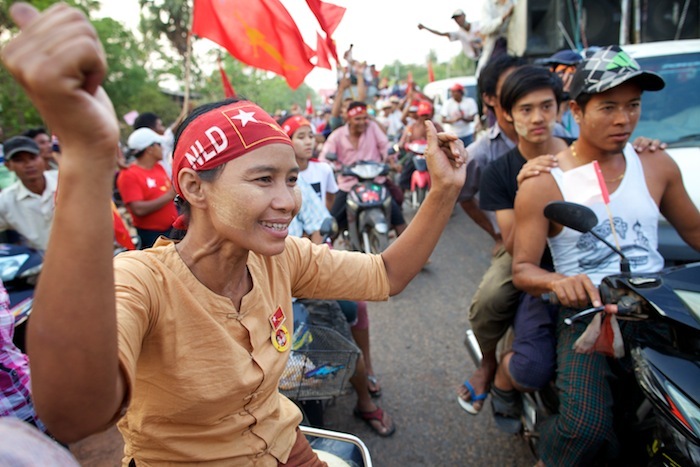 An NLD supporter welcomes Aung Sun Suu Kyi to Kawhmu. 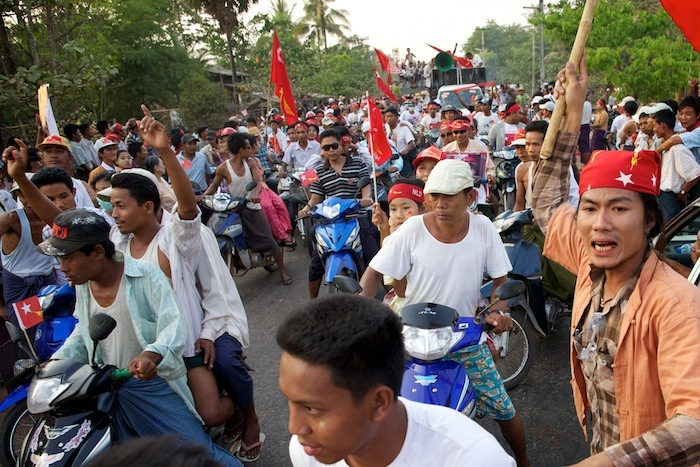 Thousands of NLD supporters descend on Kawhmu on the eve of the by-elections. On election day flanked by her security guards NLD leader Aung San Suu Kyi visits a polling station in Kawhmu, south west of Rangoon (Yangon) where she is standing in the by-election. Aung San Suu Kyi visiting a polling station. 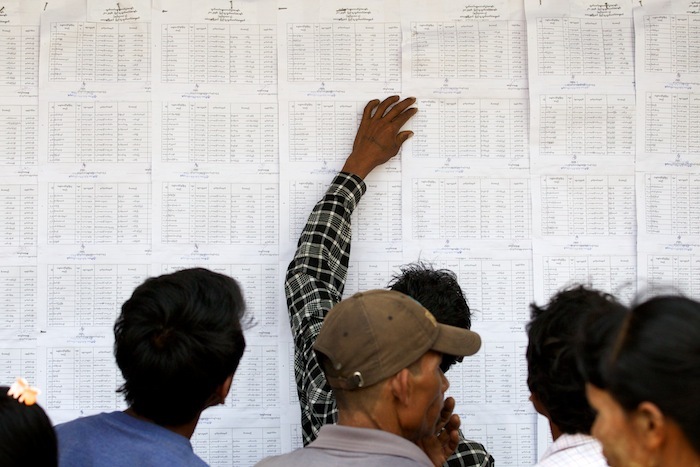 Voters in Natsingone High School in Kawhmu south west of Rangoon (Yangon) check their names are on the voting list during the by-elections. 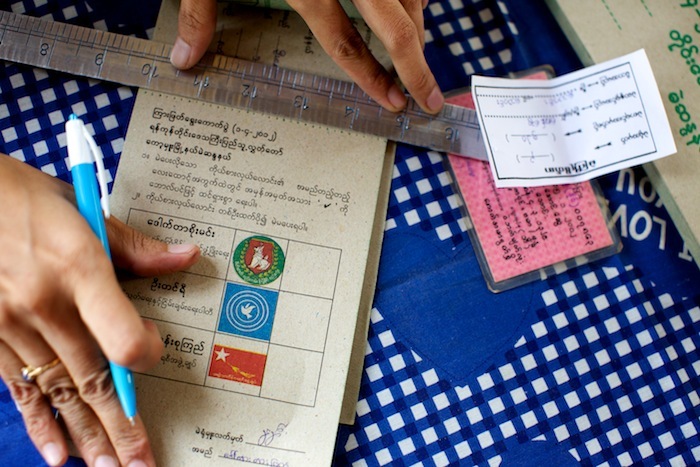 A ballot paper in Natsingone High School in Kawhmu south west of Rangoon (Yangon) during the by-elections. 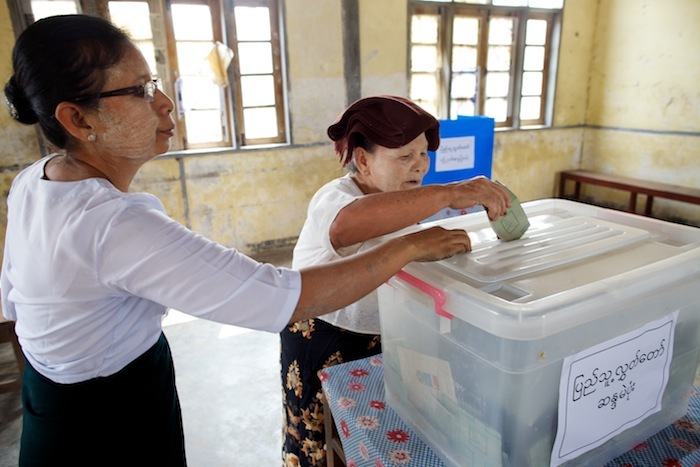 A woman places her vote with the assistance of an official in Natsingone High School in Kawhmu south west of Rangoon (Yangon) during the by-elections. 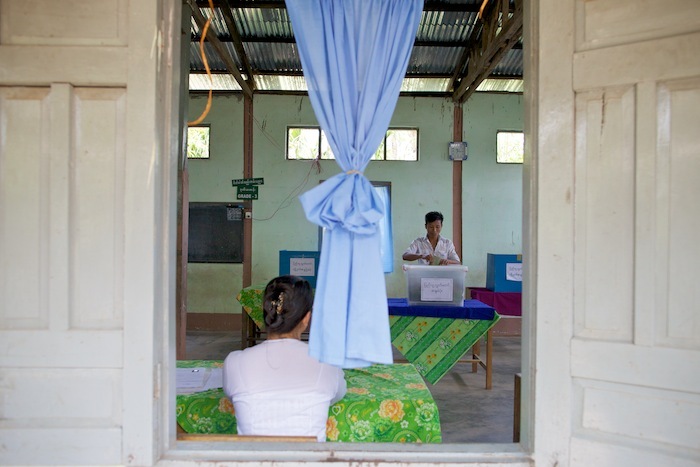 A woman places her vote watched by party observers in one of the many schools used as polling stations in Kawhmu south west of Rangoon (Yangon) during the by-elections. 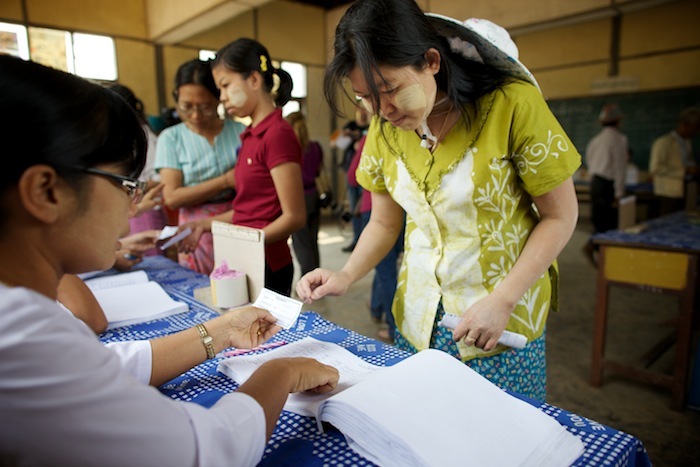 A man places his vote in one of the many schools used as polling stations in Kawhmu south west of Rangoon (Yangon) during the by-elections. 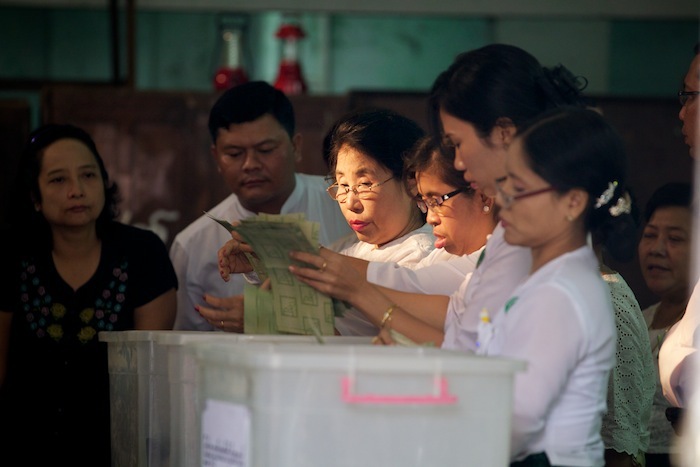 Officials taking out the ballot papers from the ballot boxes in Mingalar Tuang Nyunt Township in Rangoon (Yangon) following the by-elections. 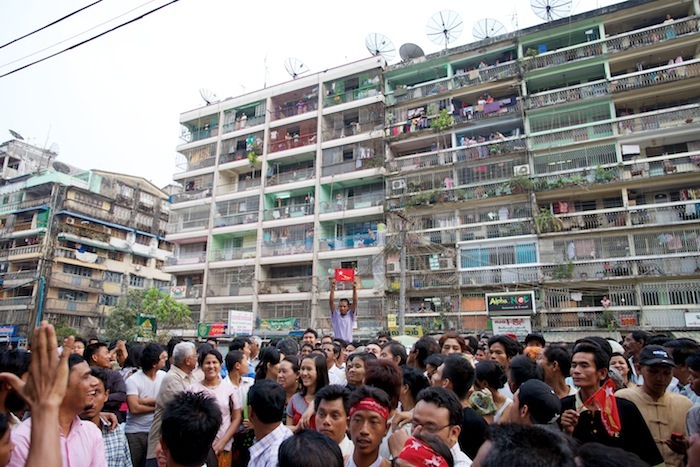 A large crowd in Mingalar Tuang Nyunt Township in Rangoon (Yangon) outside the ballot counting station wait in anticipation as the results start coming in following the by-elections. 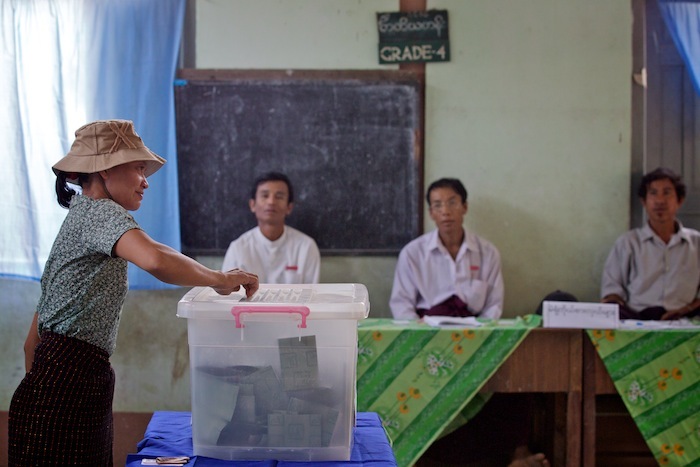 An official shows an empty ballot box to the large crowd gathered to hear the results of the by-election in Mingalar Tuang Nyunt Township in Rangoon (Yangon) following the by-elections. 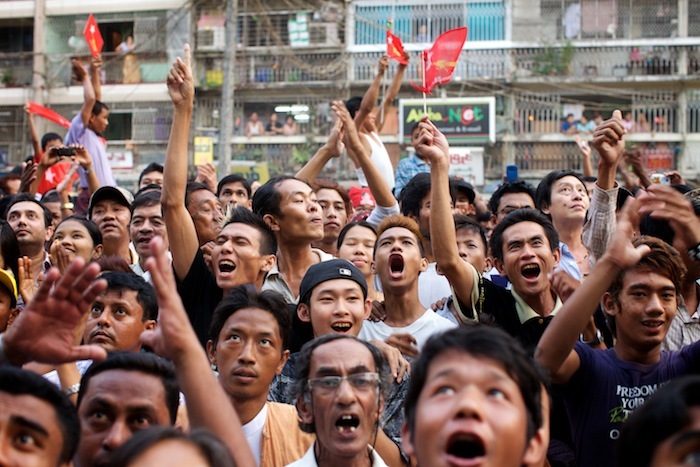 The crowd reacts as news of NLD wins come in. 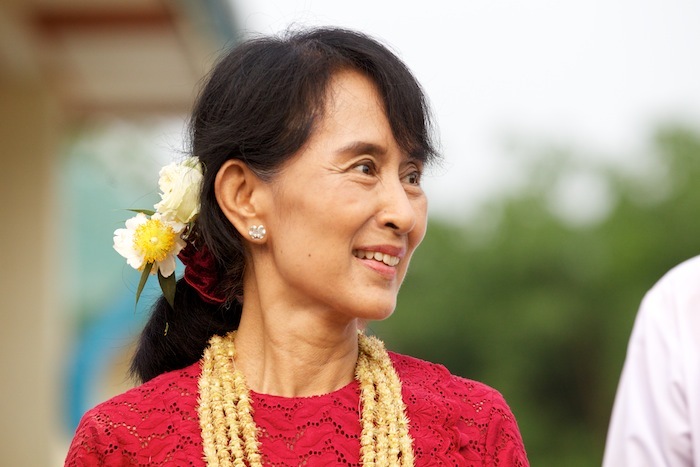 Aung San Suu Kyi has claimed victory in the elections for her post on government. Time will tell how successful in changing the regime the election will have.